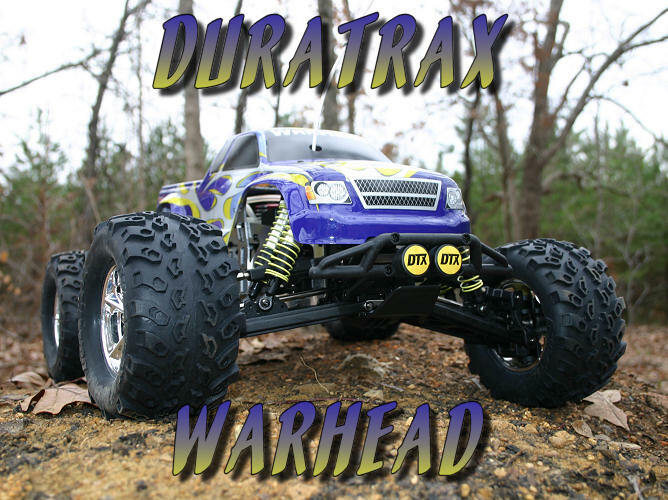 Around a year ago, Duratrax teased the RC community with the release of an 1/8 scale monster truck referred to as the Warhead. It took longer than Duratrax anticipated but the release of the truck is finally here, and it certainly looks ready to tackle any off-road terrain that gets in its way. The twin vertical chassis setup is well known for its durability, but often offers issues in regards to maintenance. With this in mind, Duratrax set out to change this common complaint associated with this chassis style. I’ll admit I’ve wanted to check out this truck since it was first mentioned, and can’t wait to get started. First though, I’ll need to tear through the various components to give you, the reader, a good idea of what Duratrax equipped this truck with. Once that’s complete, it’ll be time to hit the dirt and see how well it performs. So let’s get started, and see how big of a blast the Warhead creates! Some May Miss Rotary Starter Dual Tanks a Little Awkward. 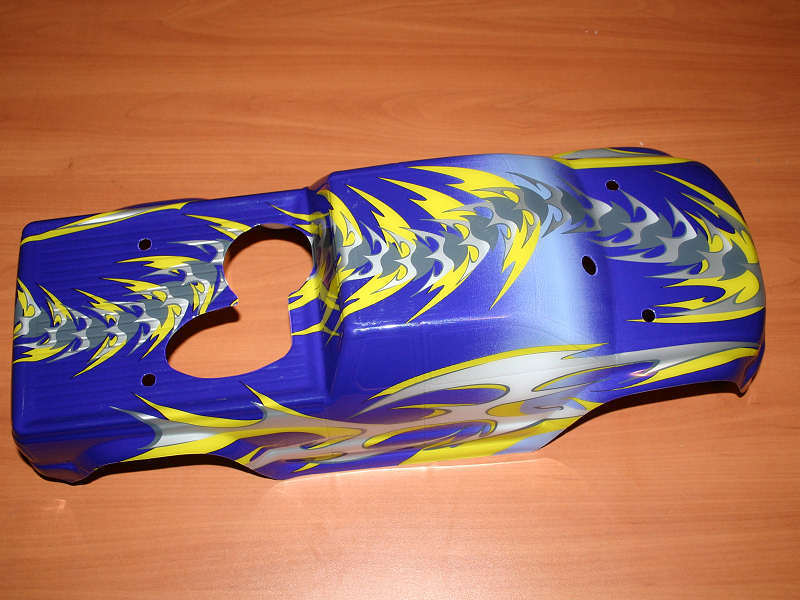 The body for the Duratrax Warhead comes screen-printed in one of six colors. I received the purple version of the body. The body sports a tribal-based design from front to back, of which the exact colors will vary somewhat depending upon the main body color is. Since the body is screen printed, you’ll use the supplied window stickers to give the truck a finished look. The other Warhead colors offered by Duratrax are: green, blue, red, yellow, and white. You would expect Duratrax to deliver a well-rounded amount of documentation for the Warhead, and they do not disappoint. You get a manual that covers the basics of operation, and what the various adjustment operations do. In addition to that, a separate sheet contains an exploded diagram and parts list. However there’s one more important item, a DVD. The DVD is not a replacement for reading the manual, but rather an additional item to help get you familiar with running your truck. There are some other items, besides the manuals and documentation, which you’ll receive as well. First among these is the sticker sheet that will help you round out the looks of the included body. You’ll also get some body clips, along with a variety of wrenches. To help you prepare the air filter for its first use, Duratrax also throws in a couple plastic vials of air filter oil. 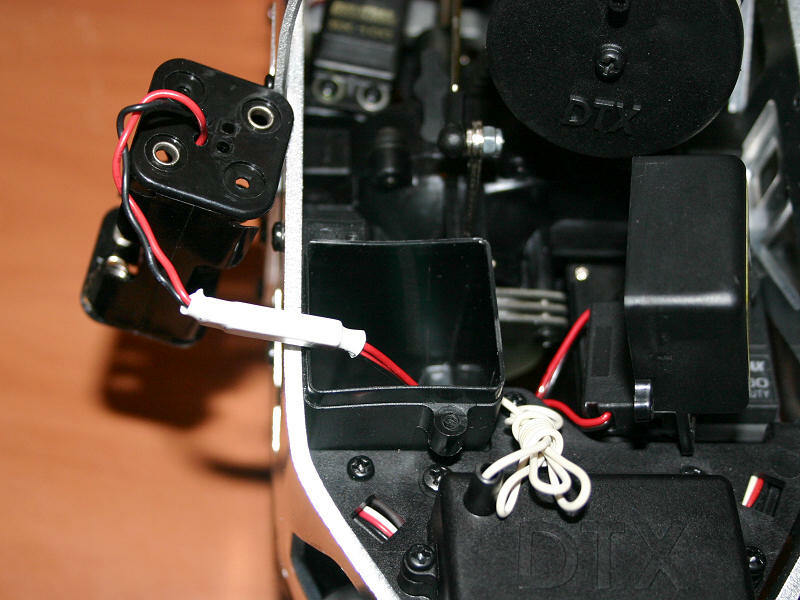 To get the radio and receiver ready, Duratrax also throws in the antenna for the radio and an antenna tube for the receiver’s wire. The radio included is an AM unit, manufactured by Futaba for Duratrax. 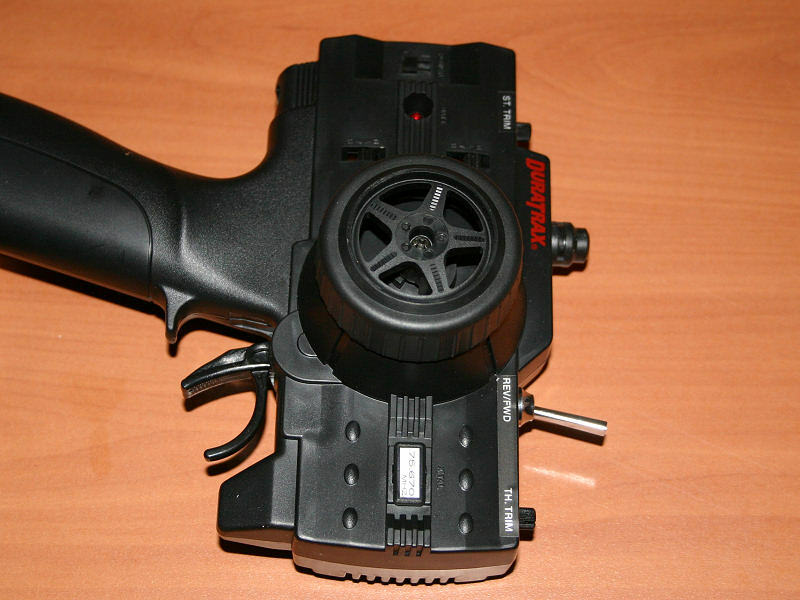 It features three channels, so that it can control the steering, throttle, and the reverse functions. I’m not overly crazy about the toggle switch that’s mounted on the radio to control reverse. While it’s definitely out of reach when the radio is being used to operate the truck, preventing an accidental shift to reverse, it comes off looking like an afterthought. A radio with an integrated third channel would look a little more purposeful. However, I can’t complain too much, as the radio will definitely handle the task it needs to accomplish. The first thing I noticed about the Warhead is that it uses a twin vertical plate setup, with a twist. The vertical plates are fashioned in a manner that makes the center of the chassis wider than it is at the front and back. This provides the necessary room to stuff all of the truck’s components into place. 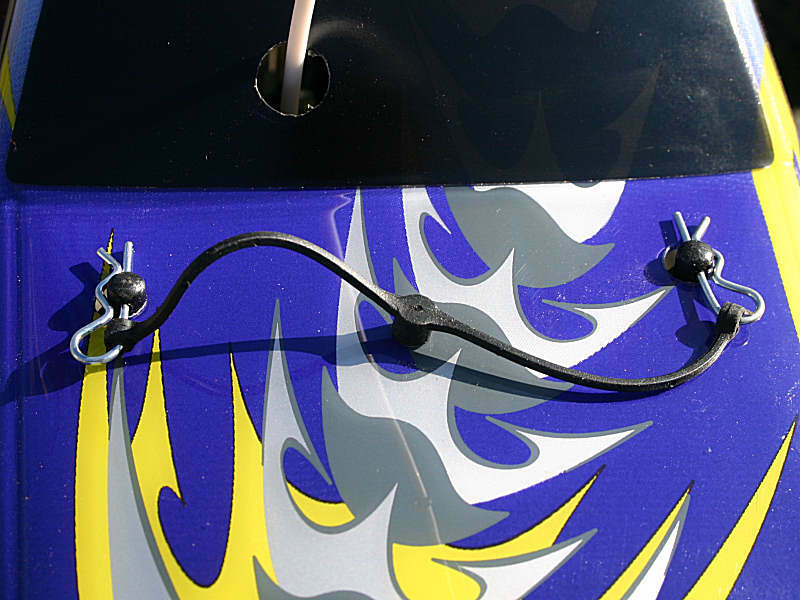 An aluminum rollbar/handle protects the top of the vehicle, while the motor’s aluminum tuned pipe hangs off the left-hand side. 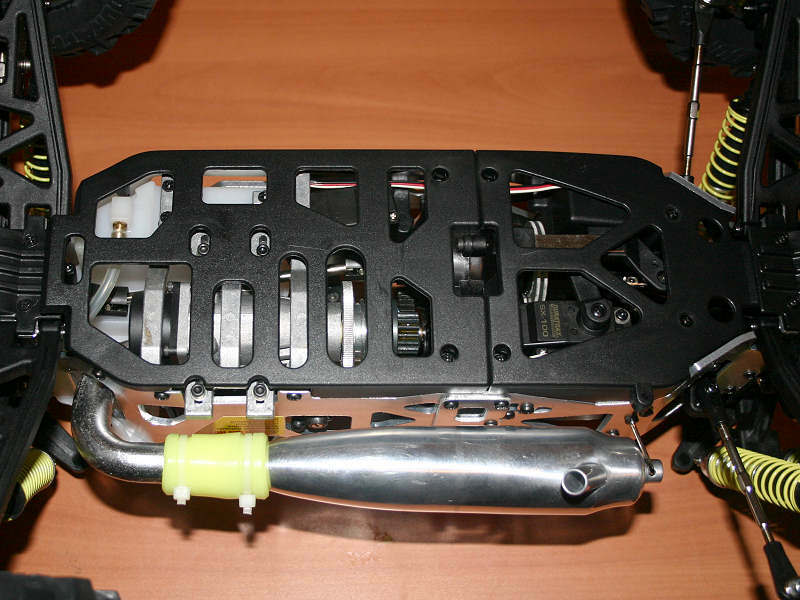 The chassis itself is pretty crowded, with all of the necessary components being installed between the plates. Some areas of the truck may be a little harder to access than a horizontal-chassis truck, but you can usually access most components from the top or bottom with some patience. The vertical plate approach is a trade-off of sorts. While some maintenance tasks can be a little more difficult, the advantage of this type of setup is the overall strength of the truck is increased. When you examine the bottom of the truck, you’ll see that Duratrax has equipped the truck with a pair of plastic plates along the underside of the truck. These plates can be easily removed, as they are held on by only a few screws. However, they perform a vital function in regards to protecting the underside of the truck from rocks and other obstacles. In addition to this, the front plate also serves as a brace for the truck’s bellcrank steering linkage. Also notice that the area around the flywheel is open, making the use of a starter box possible if you’d like to go that route at some point. 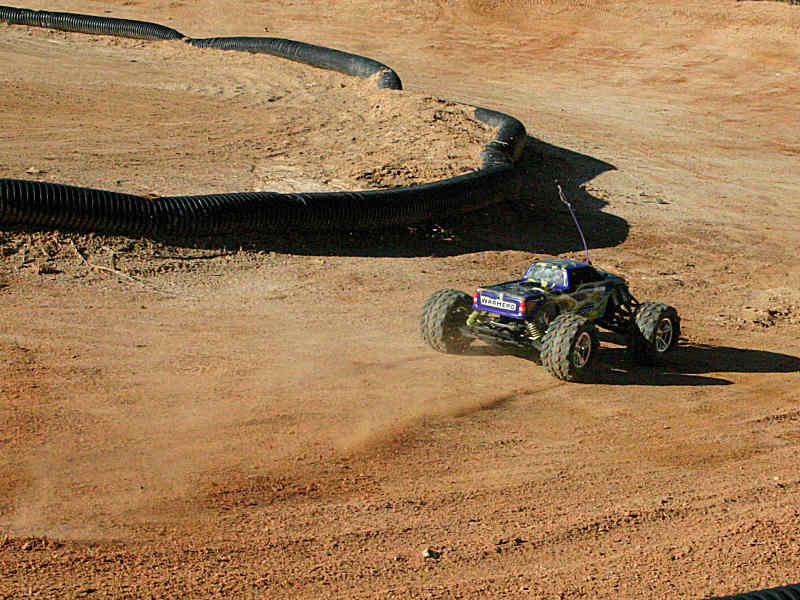 The Duratrax Warhead uses an eight shock suspension layout to handles the jumps and bumps of off-road driving. The shocks are provided more adjustability options than any other truck I’ve come across in the hobby. This allows you to set the chassis height high for jumping and bashing, or down low if you plan on handling being a key factor. This latter will appeal to the racers looking at purchasing a Warhead. 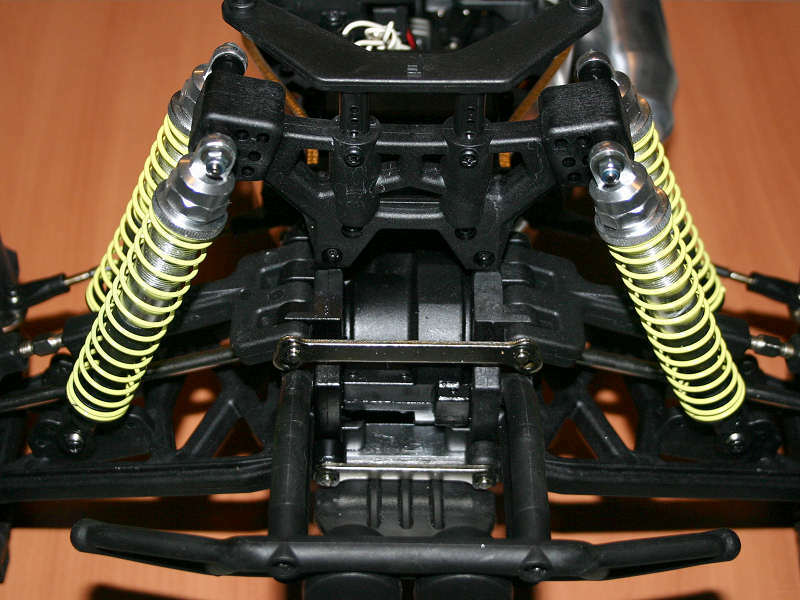 The suspension arms are tied to the bulkheads by 3.5mm suspension pins. 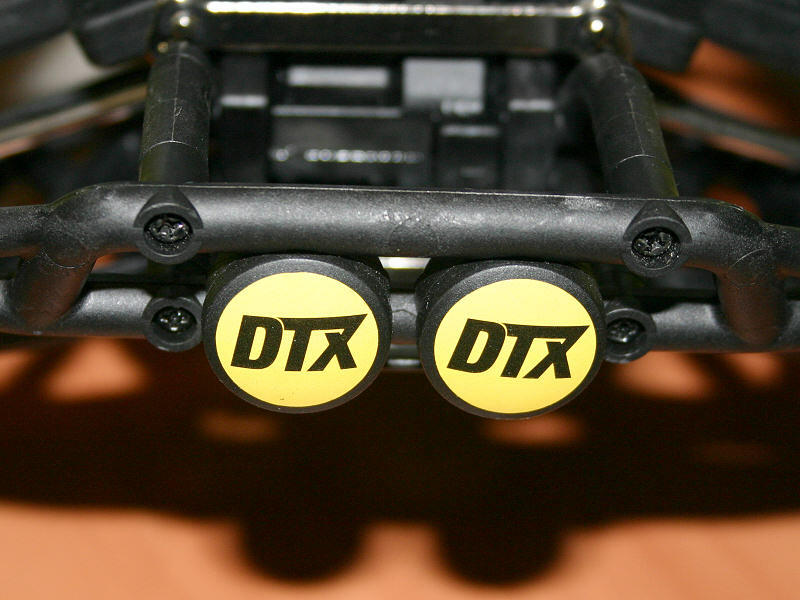 Since this sort of setup places a lot of stress on the bulkhead area, during a head-on collision, Duratrax has braced the upper and lower suspension pins with 2mm aluminum tie bars at the front of the bulkhead. At the rear of the bulkhead assembly, another 2mm aluminum tie bar also braces the rear portion of the lower suspension pins as well. 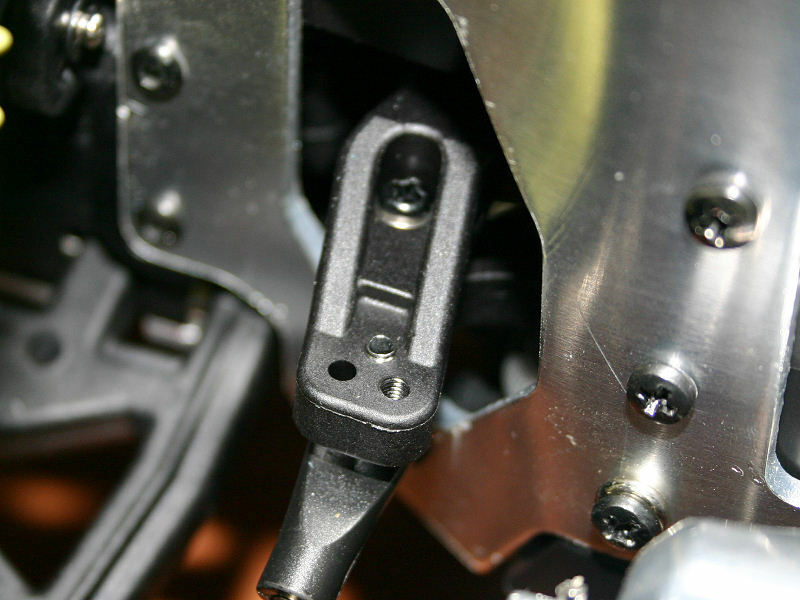 The suspension pins are held in place by e-clips on their ends. The upper suspension pins have a feature that many may not recognize immediately. That is the ability to alter the roll center of the front suspension. 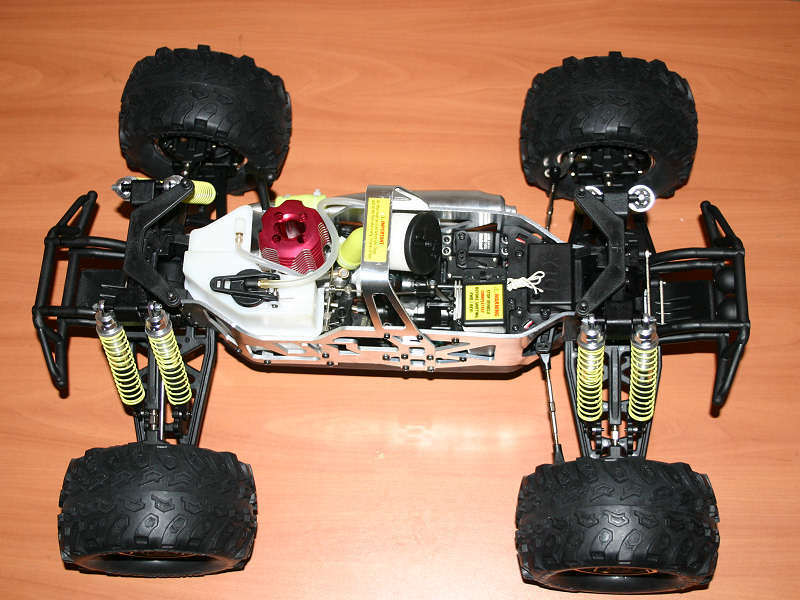 You are given two options for the upper suspension pins, and switching it between the upper and lower holes affects how the vehicle reacts when cornering, as well as providing the ability to alter the available traction at the opposite end of the truck. A large front bumper helps to protect the front end of the Warhead, although its effectiveness is cut somewhat short by the upper front tie bar. The bumper is plastic, and its design looks as if it were made to flex upon impact. However, with it positioned against the tie bar, it simply doesn’t flex as well as it otherwise could. 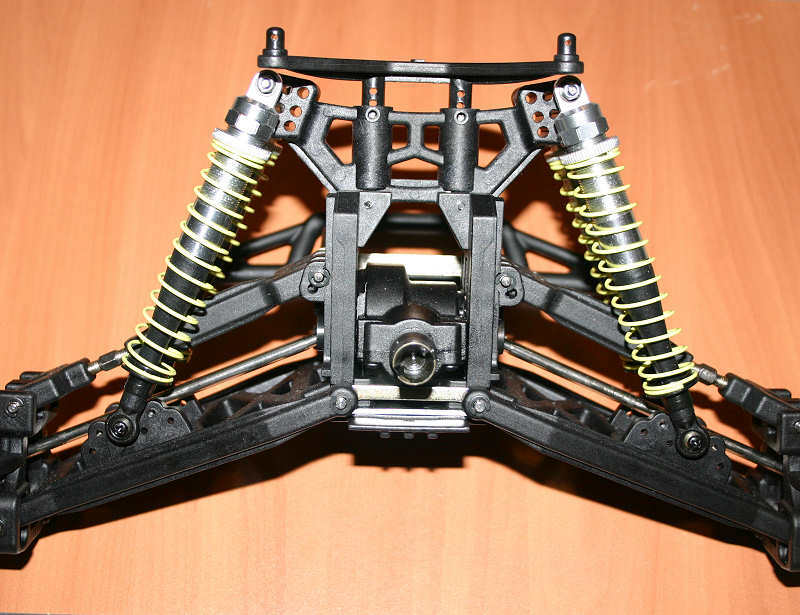 I mentioned adjustability earlier, and a close look at the mounting points on the shock tower easily showcases this. You’re given a total of nine unique positions to use, which is pretty much unheard of on an out of the box monster truck. The block on the tower containing the shock mounting positions is super thick as well, having a total thickness of 20mm. 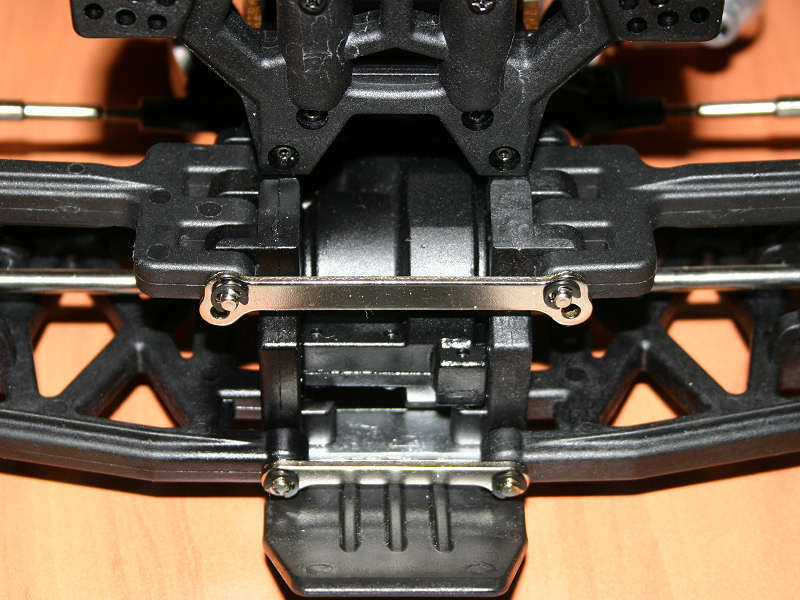 Since I covered the upper shock mounting locations, it makes sense to cover the lower positions now. 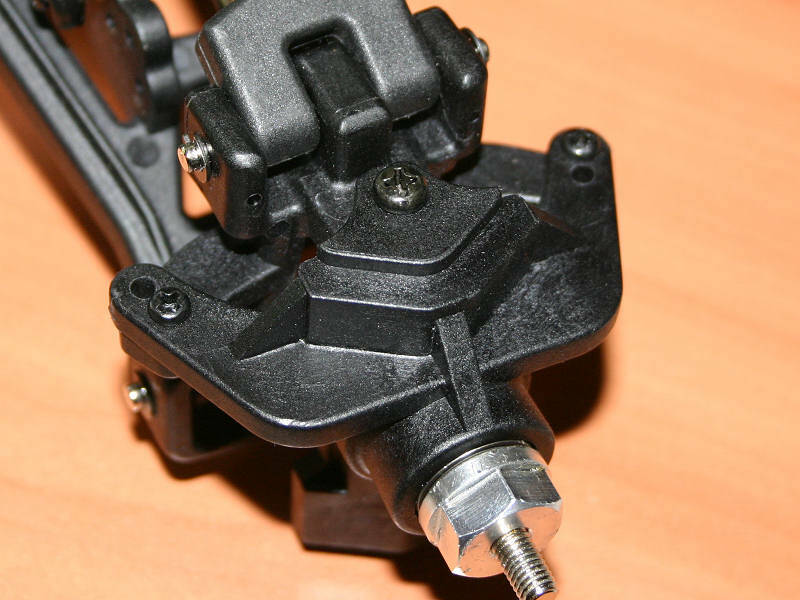 The Warhead provides seven positions on the suspension arms, and the lower end of the shock mounts to the one of your choice using a rod end and ball assembly. Adjustable turnbuckles facilitate the adjustment of wheel and tire camber angle, should you find it necessary to adjust it. 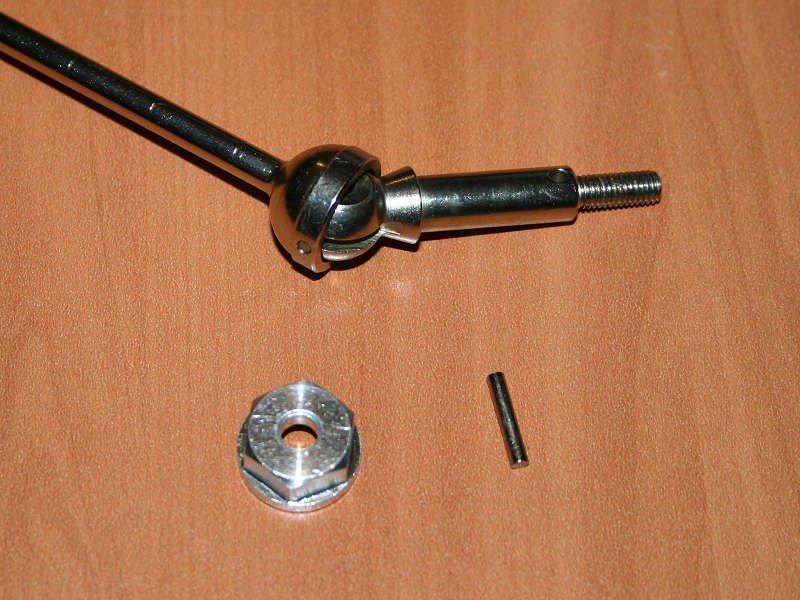 Another pair of 3.5mm pins connects the suspension arms to the c-hub steering assembly. I should point out that the Warhead also uses an approach, with the suspension arms, that I applaud. That is the fact that the suspension arms and components are universal at each corner of the truck. This means that you don’t need spares for each individual assembly available. Instead you can keep one or more spare sets on hand, and use them at any point on the truck. This makes keeping extra parts in your pitbox much easier, and cheaper. Of course all of the suspension arms are covered with the Duratrax Stress-Tech Guarantee as well, which should provide you with even more peace of mind. The Warhead uses a C-hub style steering approach. It’s obvious that during the design phase, strength was a primary consideration. It should have been, as the suspension of a monster truck needs to be up to the task, and it looks like Duratrax knew this. 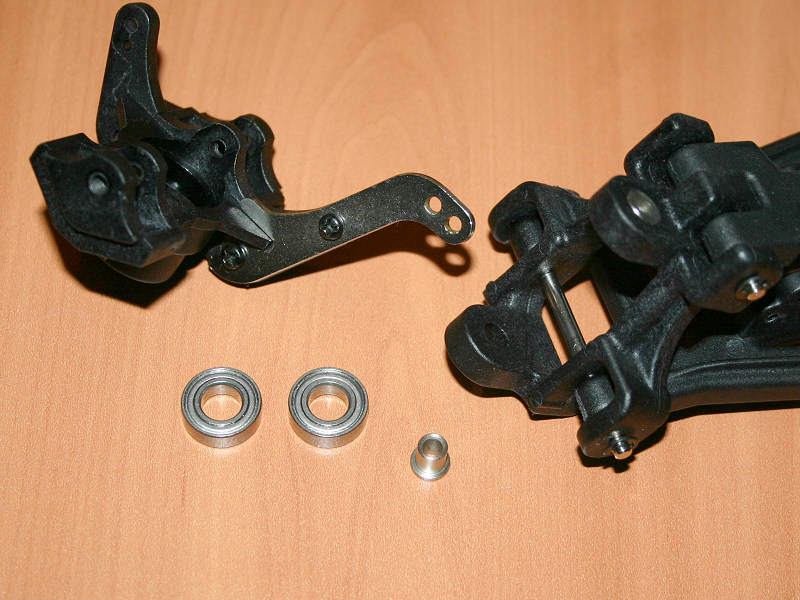 The steering block rests inside the c-hub, which is connected to the suspension arms by 3.5mm pins like I mentioned a moment ago. The upper and lower pivot points utilize aluminum inserts, and a cap head screw, to hold the assembly together. One of the unique aspects of the steering assembly for the Warhead is the aluminum steering arms attached to the steering block. 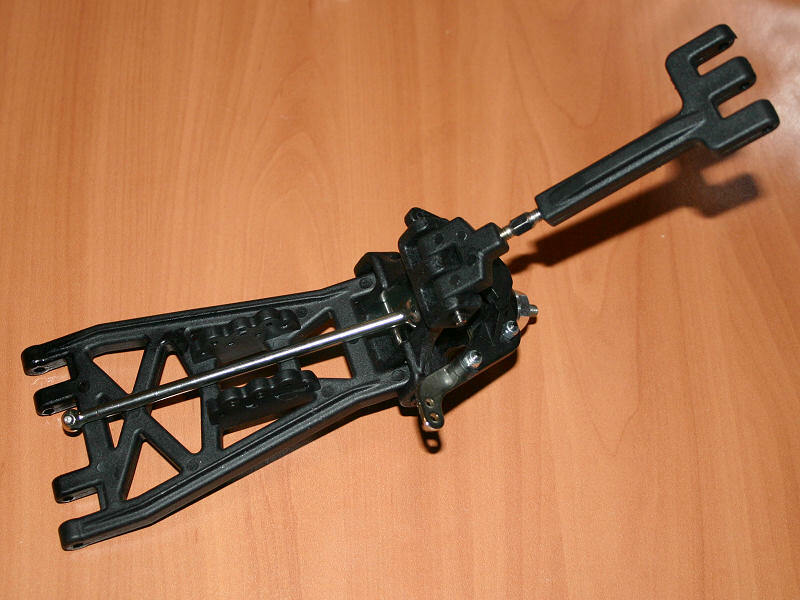 These arms are 2mm thick, and extend the steering block to the proper length to be used with the steering links. Remember when I mentioned that the suspension components are universal? The steering block functions as the toe-block on the rear and doesn’t need the long extension. This is how Duratrax made the universal component aspect work, and it also reinforces the steering system as well. The dual holes in the end of the aluminum extension facilitate the adjustment of the Ackerman angle, which alters the steering aggression of the Warhead. We’ll be touching on the Ackerman angle again a little later as well. 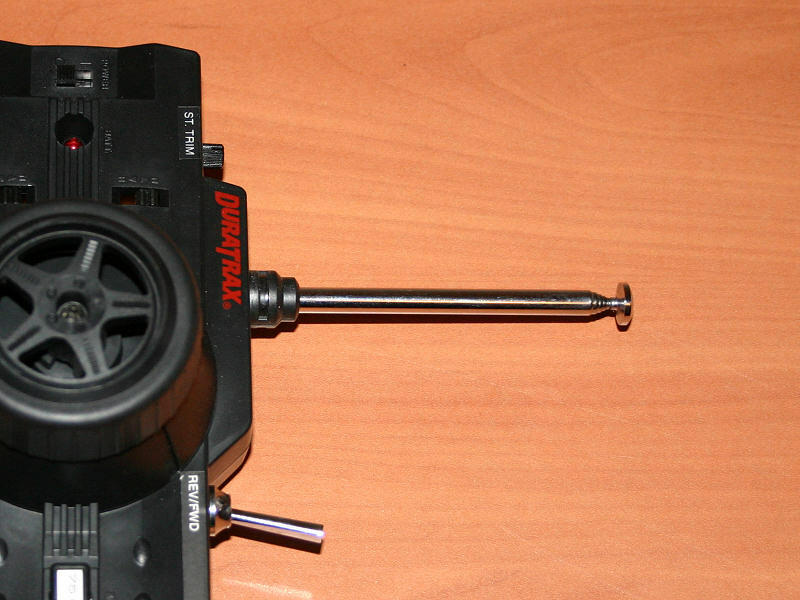 The steering block itself houses a pair of sealed 8x16x5mm bearings to keep rolling resistance low as the axle spins. The axle assembly itself uses a CVD-style approach, and is constructed on the large side to handle the load that is required of it. The axle has a diameter of 5mm, while the axle stub measures 8mm where it passes through the bearings in the steering block. A 2.5mm pin holds the axle assembly together, while an aluminum 14mm hex adapter transfers the axles motion to the wheels. The Duratrax Warhead is powered by a SuperTigre motor, boasting a displacement of .27 cubic inches. 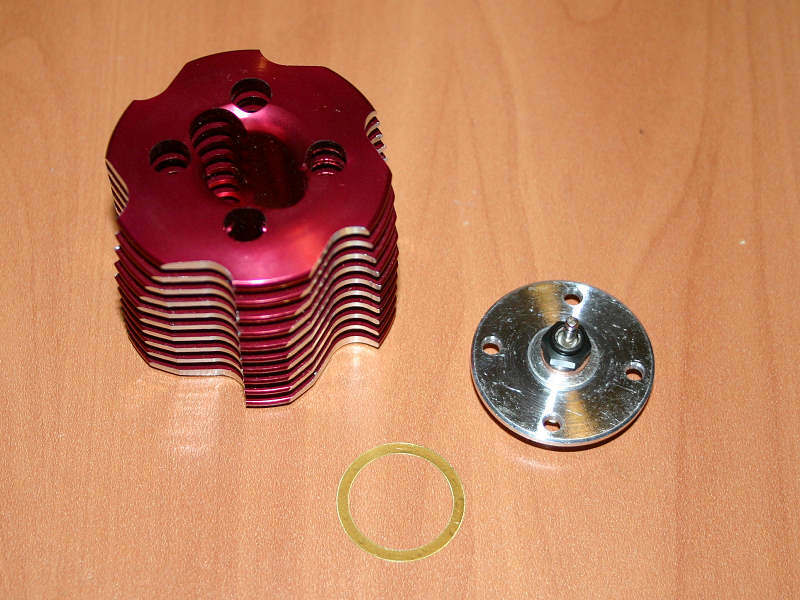 The motor is topped off by a machined aluminum head that’s anodized in red. 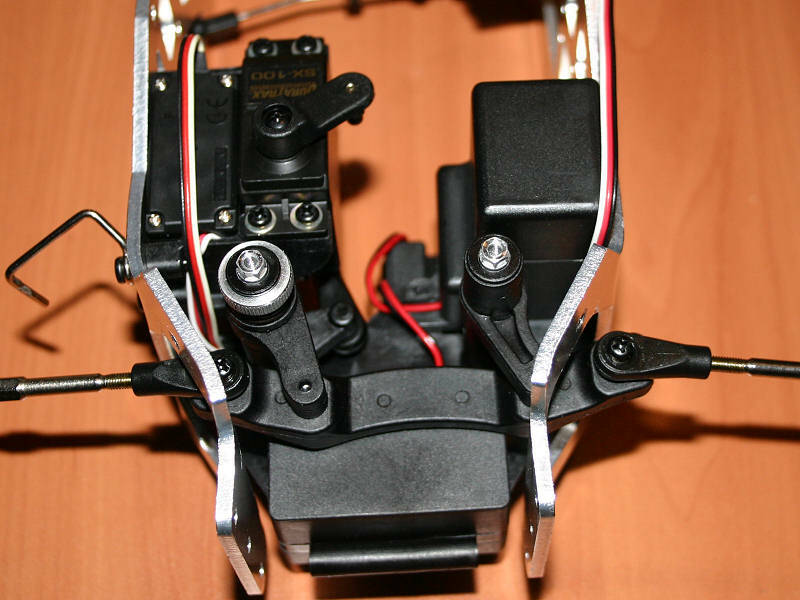 The head itself is machined in a star-like shape, and the cutouts provide you easy access to the screws that secure it to the motor mount. Incoming air is filtered by a foam air filter that is similar to 1/8 scale buggy filters, although it isn’t quite as long. One important thing to note about the filter is that it is not pre-oiled at the factory. 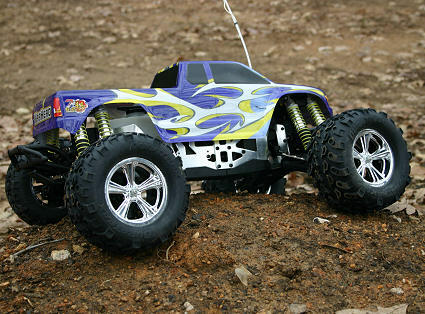 This is not typical of most RTR models and can be easily overlooked, especially by a beginner. 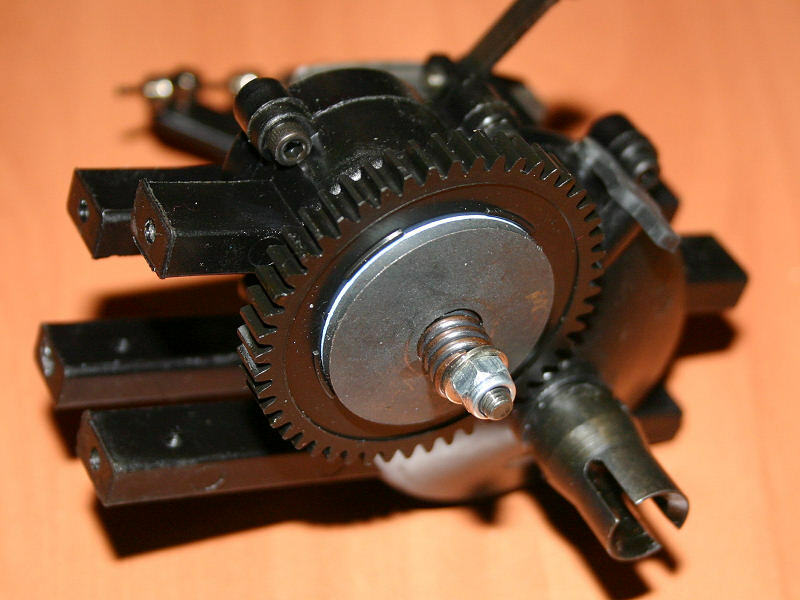 The high speed needle, and the idle adjustment screw, is found on the right-hand side of the motor. 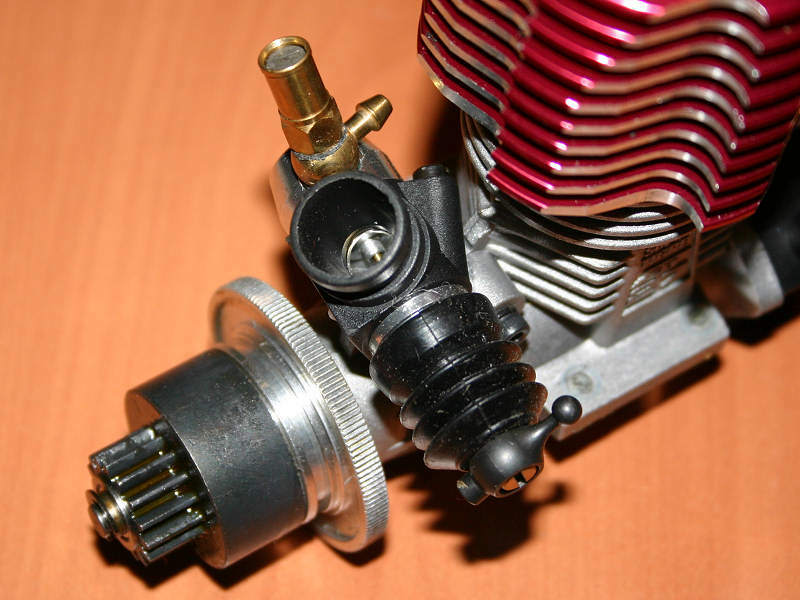 The high speed needle is easily reached when the motor is in the truck, although the idle adjustment screw is fairly tough to access due to the location of the fuel tank. While I was able to access it for tuning purposes, it does take a small amount of patience, combined with just the right angle of the screwdriver. From the left-hand side of the motor, you’ll see the low speed needle, which is inside the throttle arm. The low speed needle is easily accessed through a hole in the vertical chassis plate. 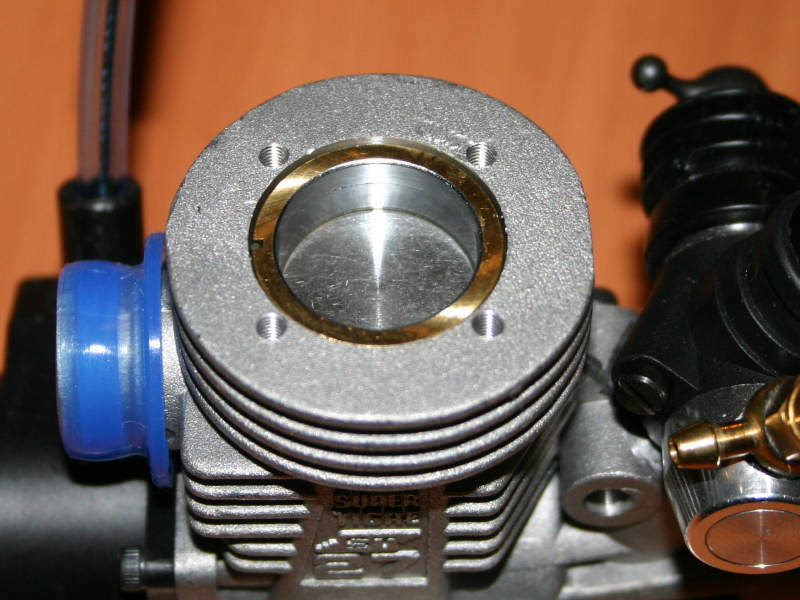 The SuperTigre motor sports the use of true ABC construction, providing a long life and excellent compression. 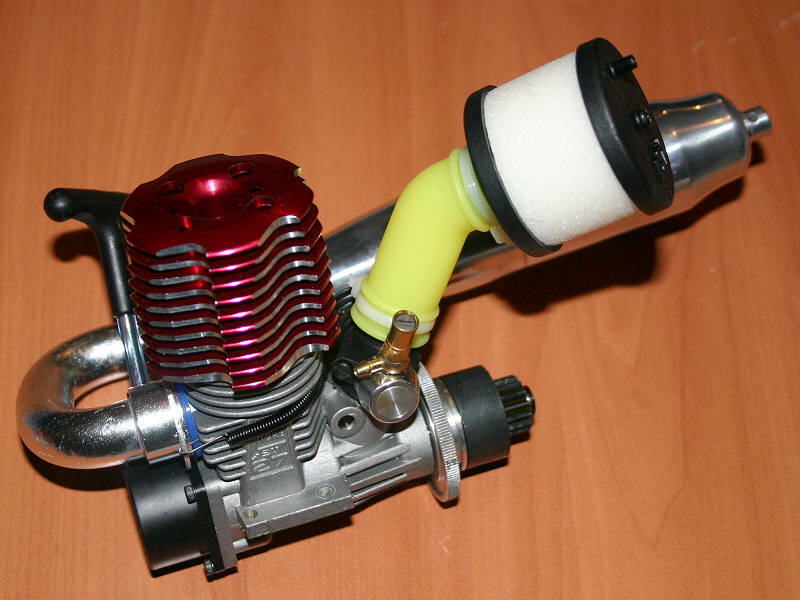 An aluminum tuned pipe and header provide proper backpressure, and keep the motor operating in its optimum powerband. 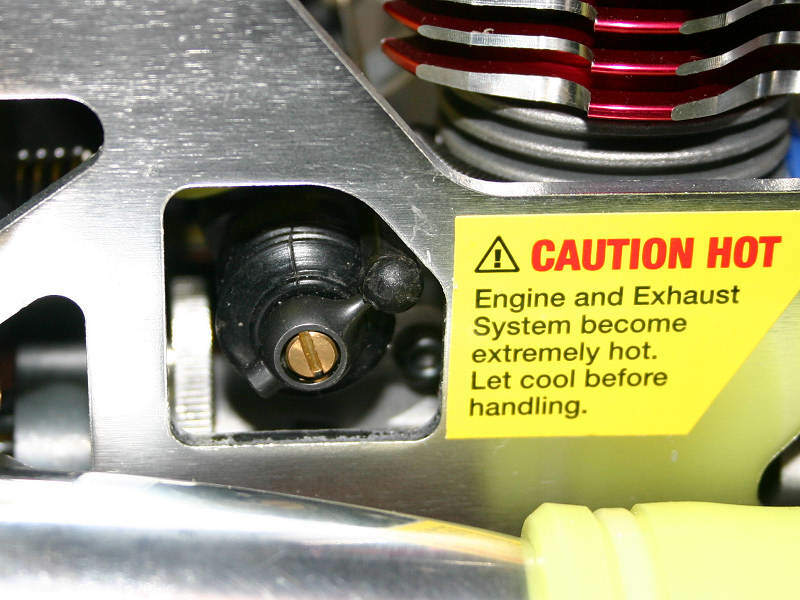 To get the motor fired up, the motor is fitted with a pullstart. 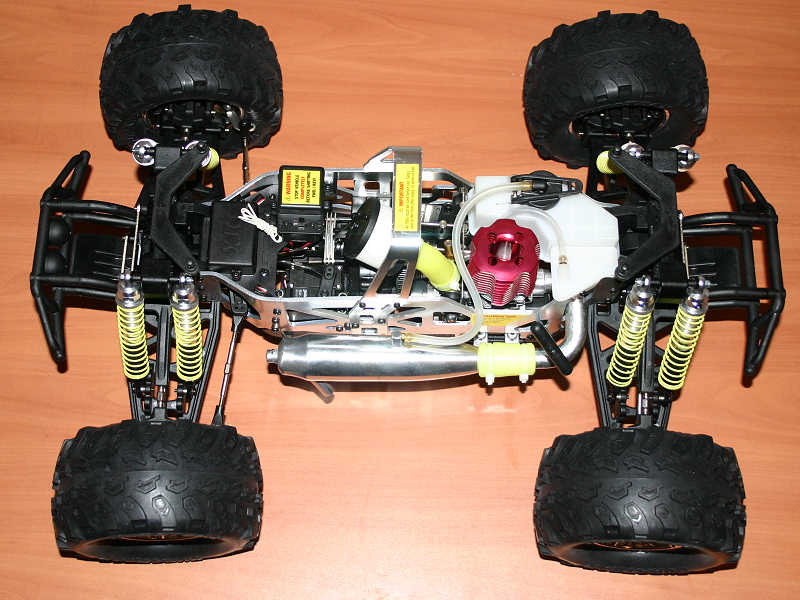 If you prefer to go another route, Duratrax has conveniently developed the truck so that a starter box can access the motor’s flywheel from underneath the chassis. The motor’s head is machined from aluminum, as I mentioned earlier. Not only does it look good it’s an example of form following function as well, with the access it allows to the engine mount screws. 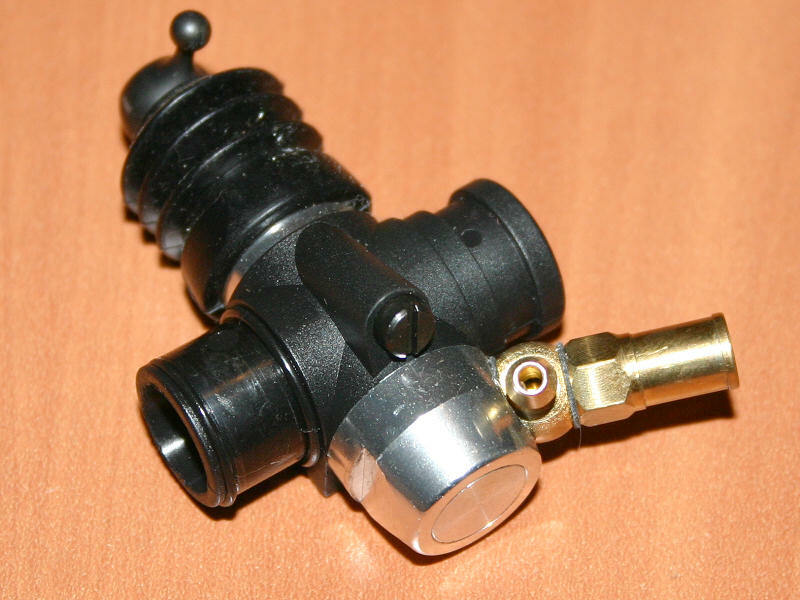 The head also makes use of a separate head button for the glow plug. This is an excellent touch to a RTR motor, and something that proves useful in the event that the glow plug hole strips. It’s always cheaper to replace just a stripped head button than the whole head itself! The SuperTigre motor sports a two shoe clutch assembly with a single wrap-around spring. This is rather unusual for a big block motor, as most tend to use a three-shoe clutch and individual springs. However, Duratrax must have felt this approach proved itself to be a good match for the truck’s performance. Covering the two-shoe clutch is a 15-tooth clutch bell which rides on a pair of 5x10mm flanged bearings. At the factory, Duratrax coats the clutch bell and spur gear with some oil to lubricate them. I found that some of this oil had found its way onto the clutch shoes when I removed it. I immediately cleaned the shoes, to avoid any excess slippage and feel this is a worthwhile area for any new owner to inspect. The SuperTigre sports a composite carburetor, and uses a slide to introduce air and fuel into the motor. A black silicone boot protects the carburetor’s slide from dirt and dust, while keeping it airtight. 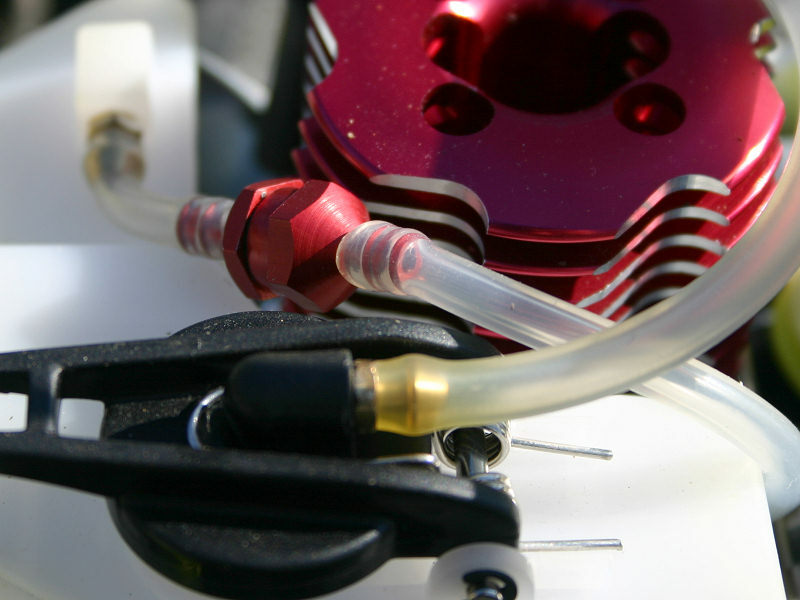 Dual o-rings help seal the carburetor where it drops into place on the motor. 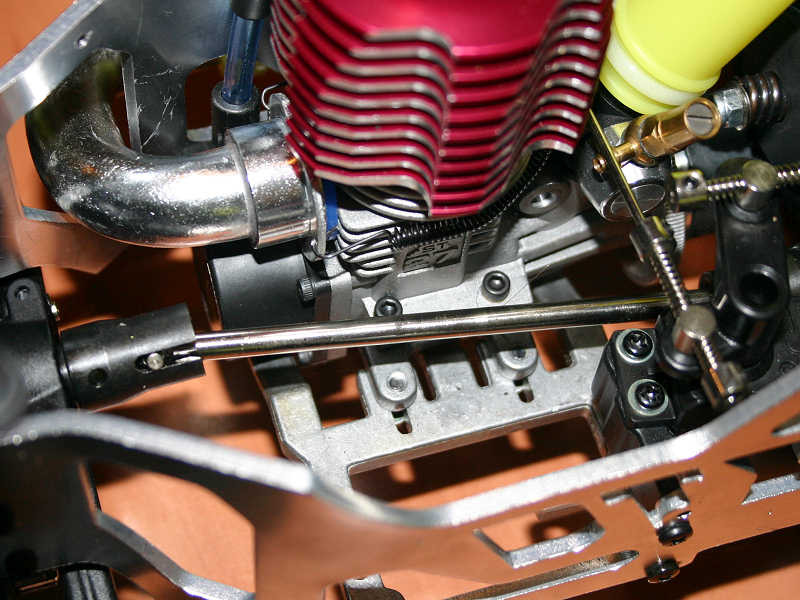 The lower o-ring in this sort of setup will often get cut as it passes the cinch bolt area of the carburetor neck. So it wouldn’t hurt to have a few spares handy in the event some maintenance becomes necessary. 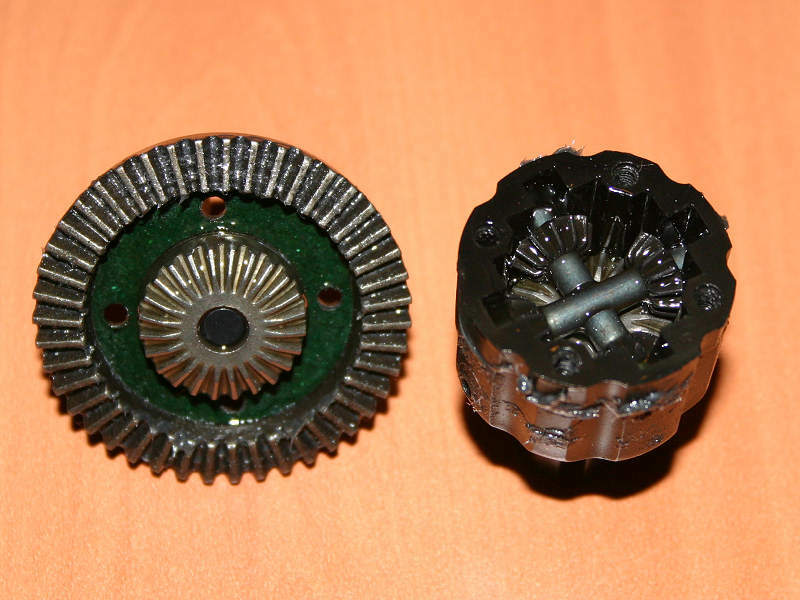 The transmission of the Warhead uses a plastic spur gear, and makes use of a disk-based slipper clutch to protect the drivetrain. The slipper’s tension is adjustable via loosening or tightening the nut on the spur’s shaft. The Warhead’s brakes utilize fiberglass disks and stainless steel calipers. Button head screws hold the assembly in the proper place on the output yokes hex adapter. A stainless steel lever applies tension to the brakes when the throttle/braking servo calls for the truck to slow down or stop. 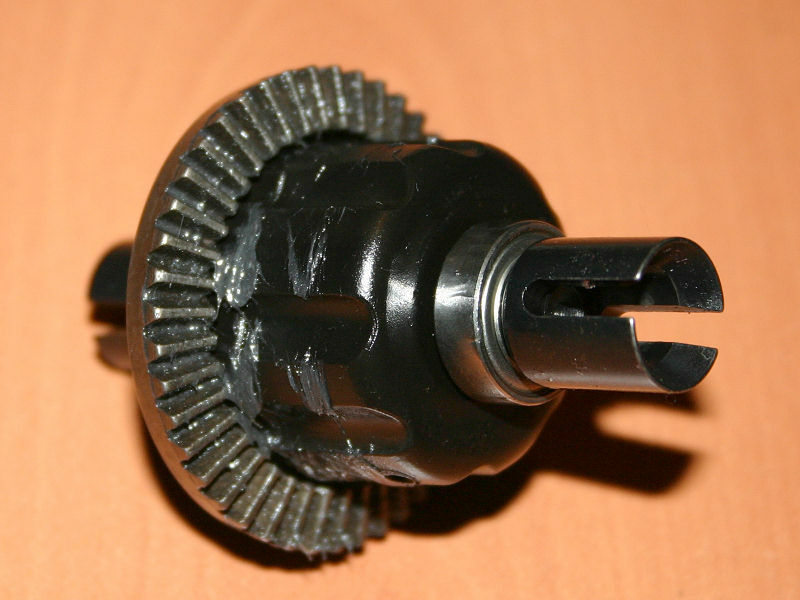 If you want to open the transmission without removing the spur gear, you’ll want to enlist a ball-end hex driver to assist you. Some of the screws are positioned behind the spur gear and make removal tough without the additional angle a ball-end hex provides. Once the transmission is open, you can get a glimpse of the mix of plastic and metal gears that transfer the power from the motor to the rest of the drivetrain. Duratrax uses a rather different approach with the transmission’s main shaft, as it uses a differential-like approach instead of a straightforward geared approach. 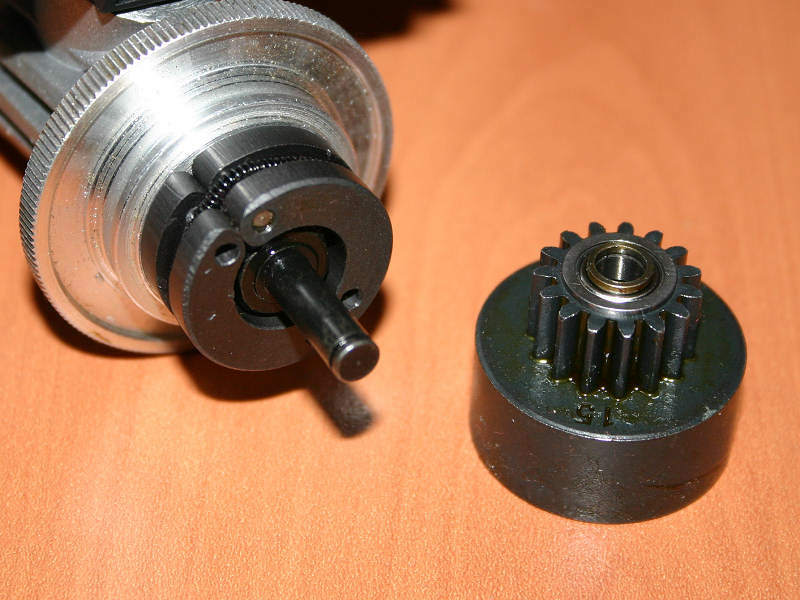 Planet gears rotate around the main shaft, and they transfer the motion to the driveshafts. 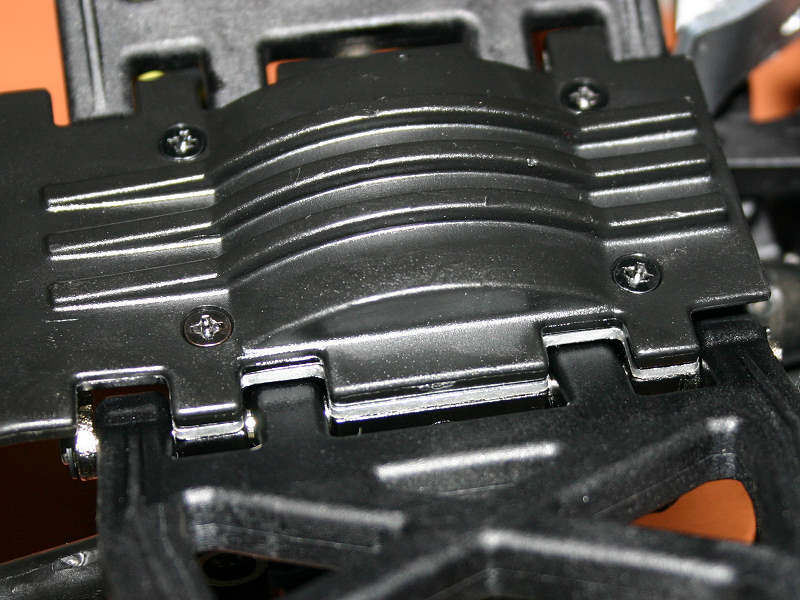 The differentials are housed in a rather large plastic housing that uses a total of six screws to hold the whole assembly together. Once you remove the top of the differential assembly, you can catch a good glimpse of the straight-cut ring and pinion gears. All of the output yokes ride on 8x16mm bearings, with a total of four being used on each differential. Once you pull the differential out, and separate the ring gear from the differential cup, you get a glimpse of how well stocked the inside of the differential is. 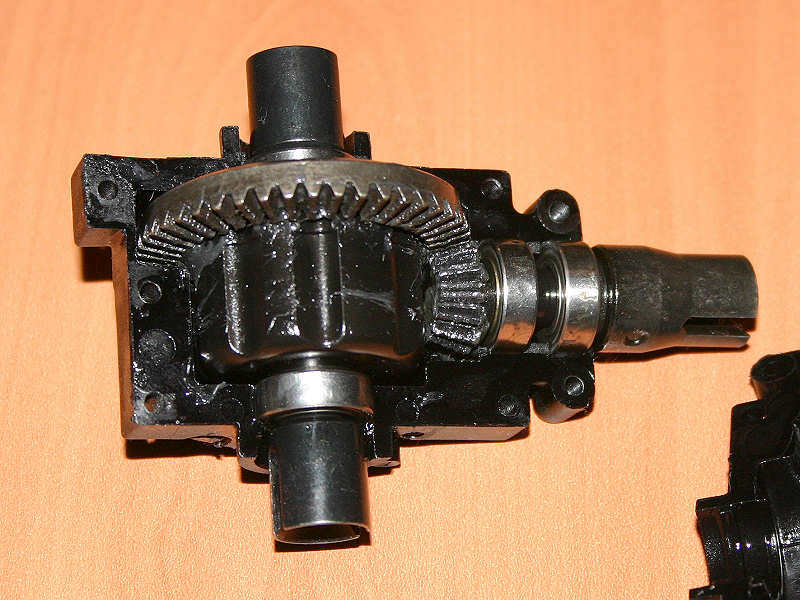 A total of six gears transfer the power from one side to the other as traction varies. Duratrax also seals the differential up as well, so that you can use differential oil to tune how tight the transfer of action is. The bottom of the bulkhead assembly is protected by a plastic skid plate that shields it from the ground during rough landings. 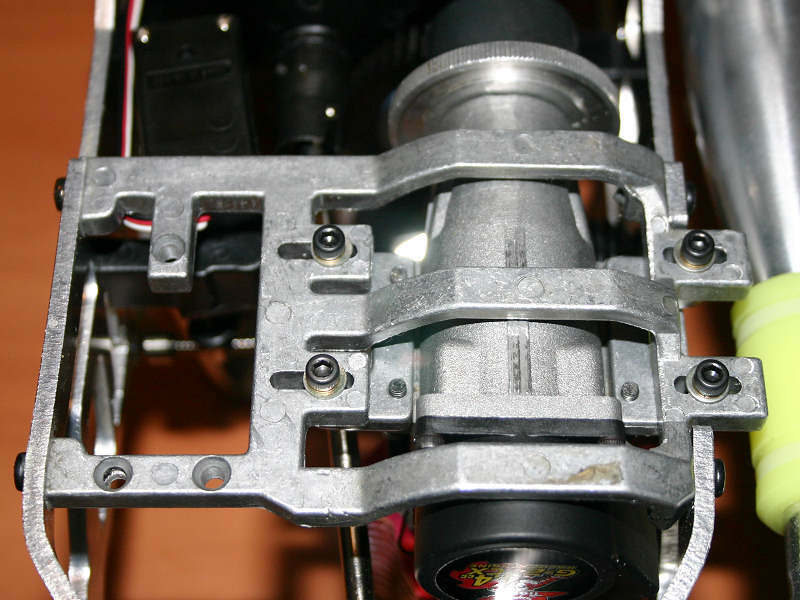 To further strengthen the assembly, an aluminum brace is fitted between the skid plate and the bulkhead assembly. The aluminum brace has a thickness of 1.5mm, and provides a great deal of additional strength to this area of the truck. 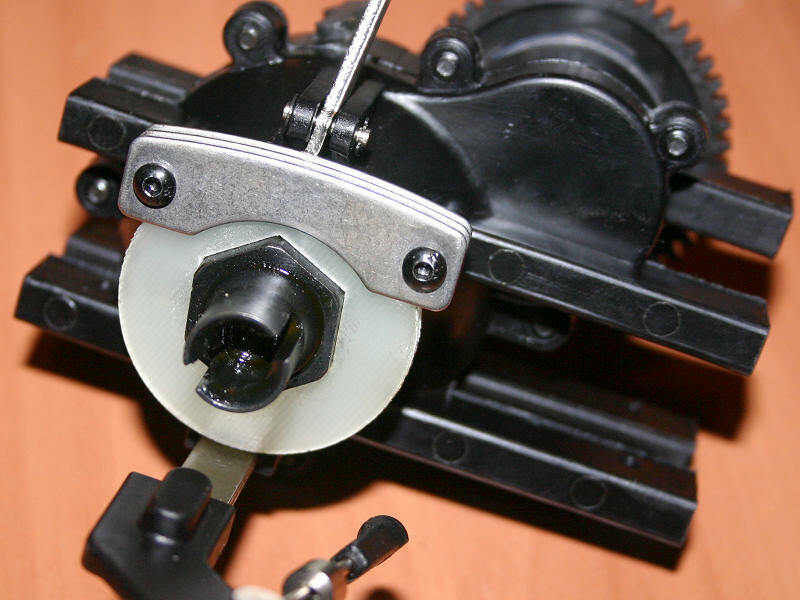 The steering linkage is a cam-driven bellcrank setup. It has an integrated servo saver, and pivots on bushings. 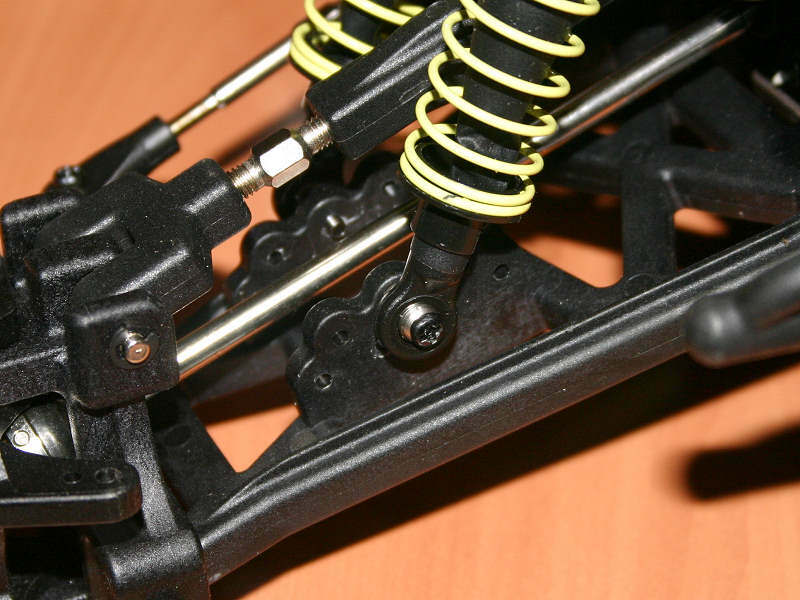 This is the sort of steering mechanism that often graces large 1/8 scale trucks, and is common place in the 1/8 scale buggy world. It should easily be up to the task of moving the tires back and forth. Even though Duratrax made it nice and thick for strength purposes, I prefer to see the center draglink made of aluminum however. An aluminum draglink just offers a great deal more strength for this area of the truck that sees a great deal of stress. On the outer edges of the draglink, you’ll find a series of three holes. 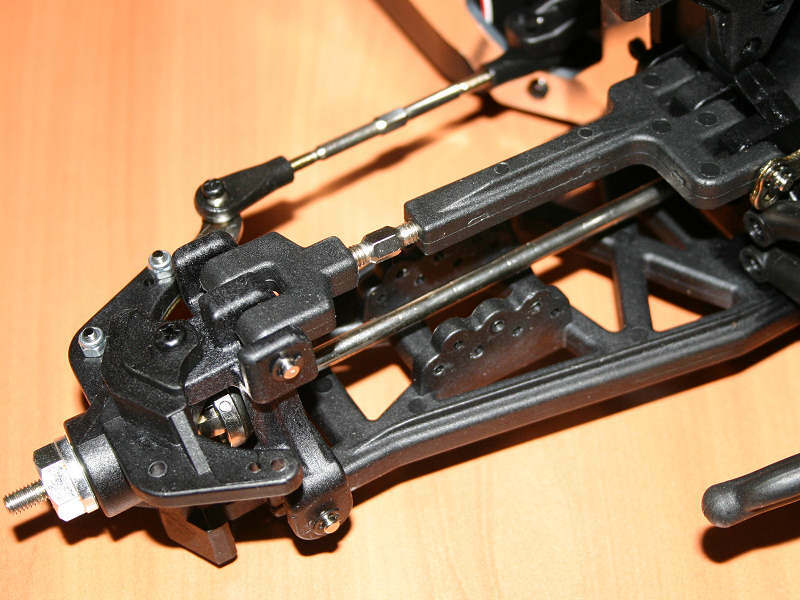 These holes allow you to tailor the Ackerman angle of the steering linkage to change its aggressiveness. 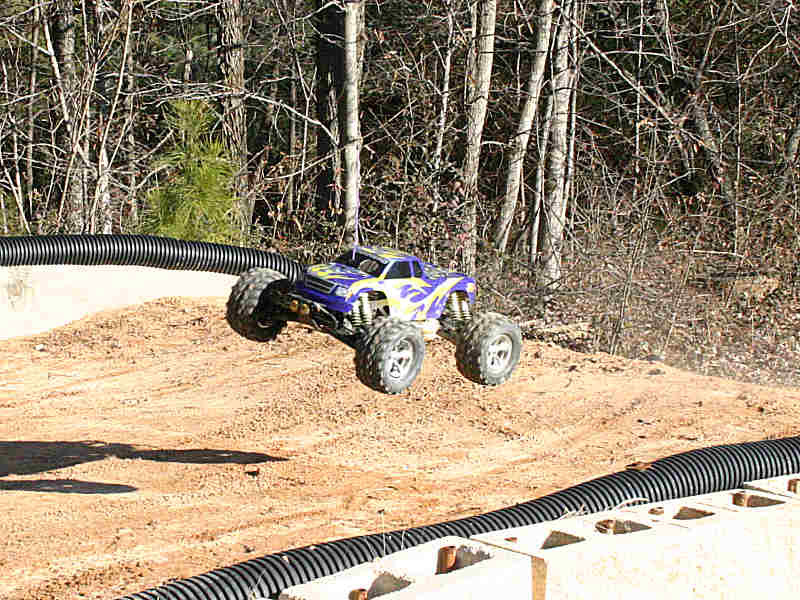 This is a feature that is often found on 1/8 scale buggies, but is rarely seen in the monster truck world. It opens up more possibilities in regards to track tuning, and steering response. 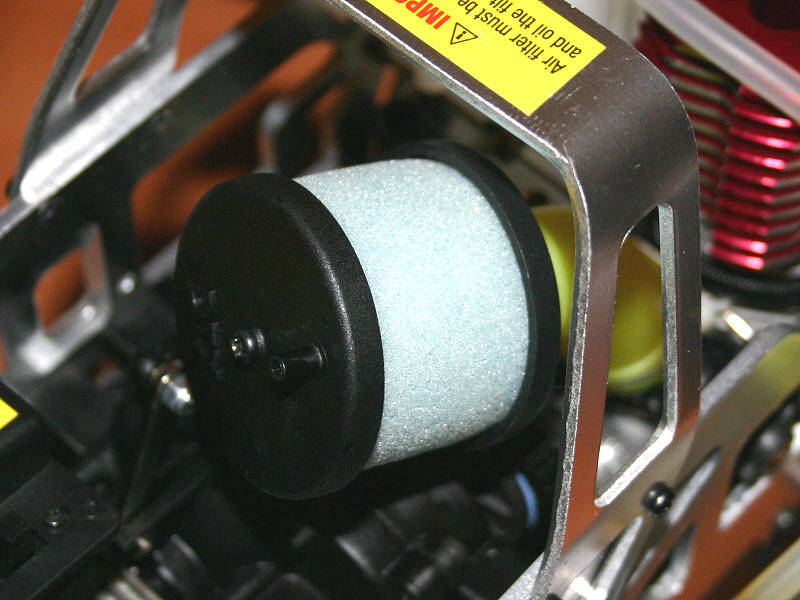 The entire steering assembly is driven by a SX-200 servo, with 124 oz-in of torque at 6.0 volts. It also offers a transit speed of .20 seconds. The fuel tank of the Warhead definitely stands out as one of the more unique designs you’ll find. In fact, I think it stands alone in that regard. The tank itself is two sections, with a smaller mini-tank that Duratrax refers to as the header tank providing the exit point for the fuel. It’s connected to the larger tank by a section of fuel line that connects them from the undersides of the tanks. The larger tank is home to the lid and the pressure line. The fuel line to the carburetor comes directly off of the smaller tank. The two piece tank system provides you with a slightly increased fuel capacity over just the large tank. If you desire, you can remove the smaller tank for easier access around the rear of the chassis, or you can leave it in place and enjoy slightly longer runtimes. The motor mount assembly stretches across the lower section of the truck’s rear end. 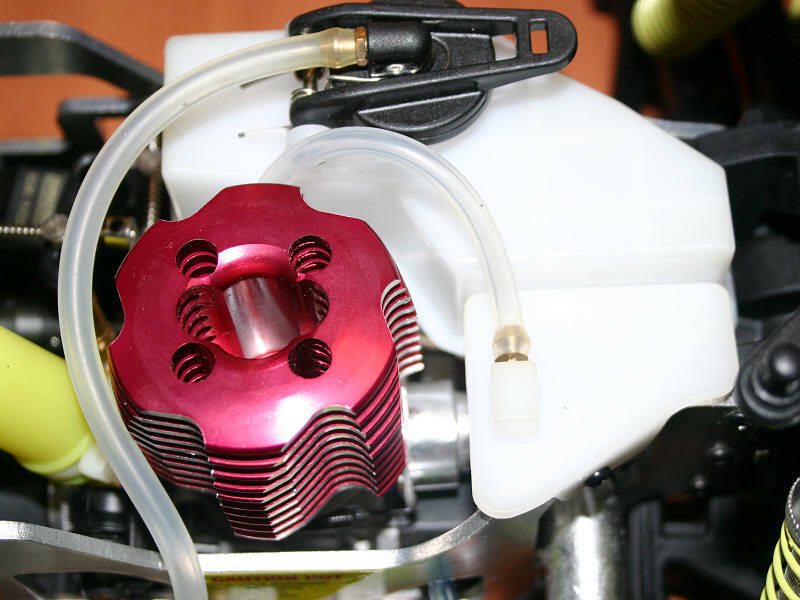 Not only does it serve as a mounting location for the motor, but it also helps to support the larger fuel tank as well. The motor mount itself is cast aluminum, and while I agree cast aluminum is generally the best material for a motor mount, I think there may be too much of it here. 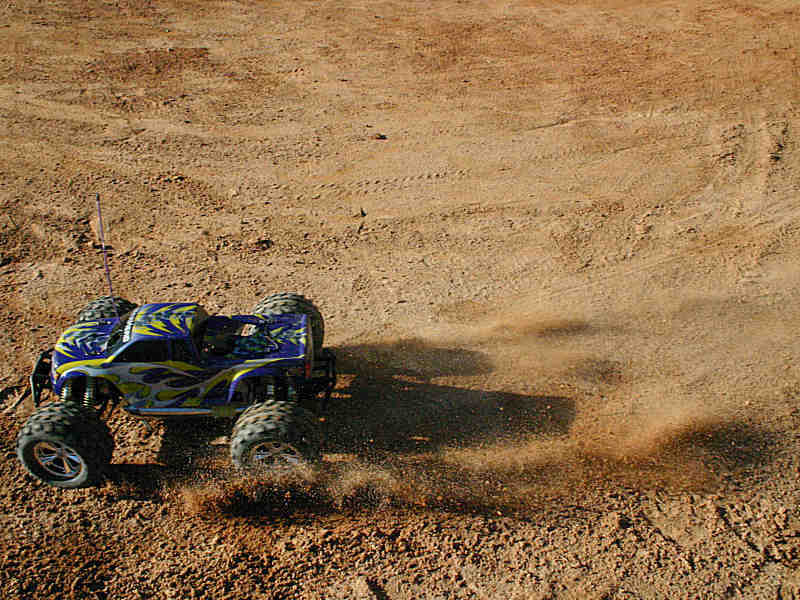 Cast aluminum will generally not handle as much stress as machined aluminum, which does provide some measure of protection to the motor in the event of a top-down landing. 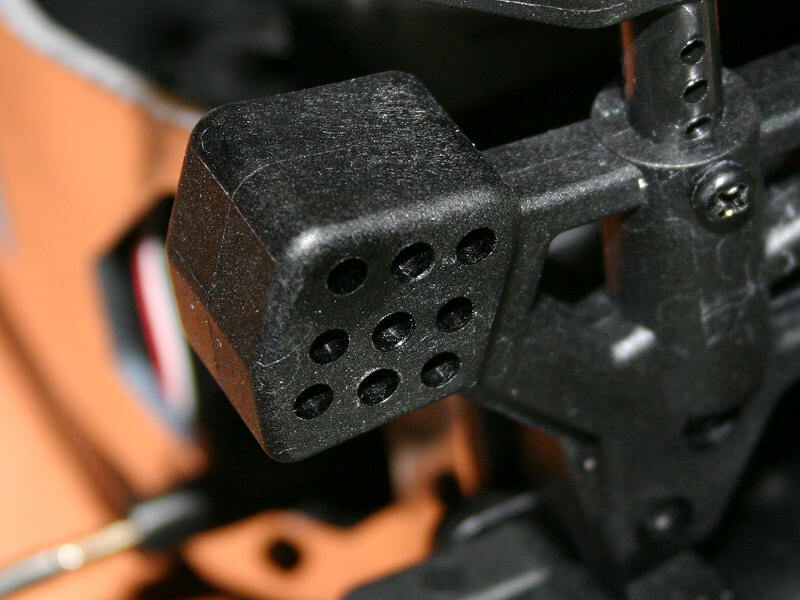 It’s better for the mount to break, than the motor block itself. However, the motor mount for the Warhead also provides some support for the twin vertical plates of the truck itself. While it may not cause any issues, it would appear that there is the potential for some chassis stress here. This could manifest itself as a break in the part of the mount that stretches from one vertical plate to the other. I would have preferred to seen the main part of the mount machined, while the smaller mount sections that tie the motor to the main mount left as cast aluminum. Time will tell how well this part of Duratrax’s design works out. The Warhead has several areas that deviate from the normal approaches seen in the monster truck segment of the market. The 5mm thick driveshafts are another example of this. Both the front and the rear driveshafts angle to the right-side of the truck at an angle to clear components between them and the transmission. While this isn’t a bad thing in itself, it does showcase that Duratrax mapped out every square inch of the truck’s layout with consideration of the other neighboring components. The receiver itself is an AM unit that operates in the 75MHz range. It’s crammed into a receiver box that leaves just enough room for the receiver and the servo wires. The receiver box is also super easy to access, and open. It serves its purpose well, and the stock receiver is fairly large when compared to some of those found in the aftermarket. Most aftermarket receivers should have no problem though, when it comes to fitting in the Warhead’s receiver box. The Warhead’s battery box bucks the normal trend. Duratrax must have had space conservation on their mind when they opted to mount the box vertically on the chassis, taking advantage of the twin vertical plate’s height. Creative thinking on their part, as it showcases the fact that an effective chassis layout was high on the Duratrax design list. The wheels on the Warhead remind me of those found on many classic muscle cars. 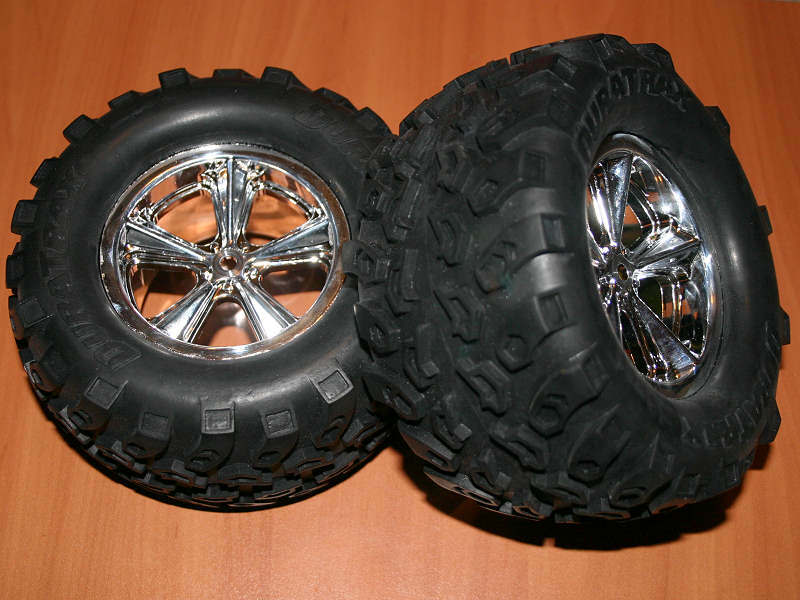 Their chrome five-spoke design looks very sharp, and has what Duratrax refers to as Outback-style tires pre-glued to them. Inside the tires you’ll find foam inserts lending support to the tires. The wheels have holes pre-drilled into them, allowing air to flow in and out of the tire as needed. The rear suspension arms are constructed in the same manner as the front, allowing parts to easily interchange between the four corners of the truck. Just like the front, the roll center of the rear can be changed. Another nice thing about the construction is the fact that the rear toe angle can be easily altered when the carriers are mounted on the rear. You are given two holes on each side of the carrier, allowing it to pivot back and forth to alter the toe angle. This makes alterations simple, without the need for a setup board. Upon first glance it may appear that the truck’s carburetor will have a hard time operating. However, that couldn’t be further from the truth as Duratrax has planned the necessary opening in the side plates well. The motor’s slide carburetor actually moves through the hole in the aluminum chassis plate as the throttle is opened. 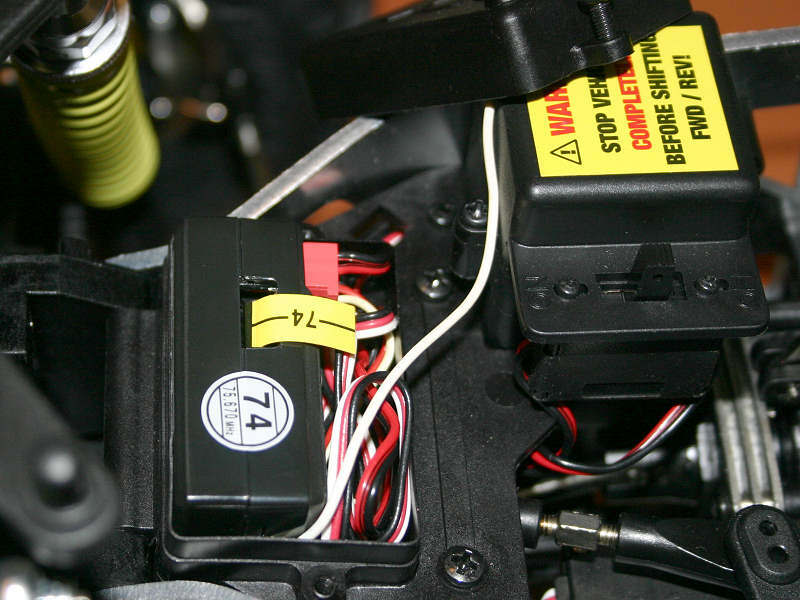 Clearances are close, but everything works perfectly, while keeping the motor well protected at the same time. Duratrax didn’t bother to equip the Warhead with plastic shocks. They went straight for the aluminum option, and then made them threaded shock bodies on top of that. 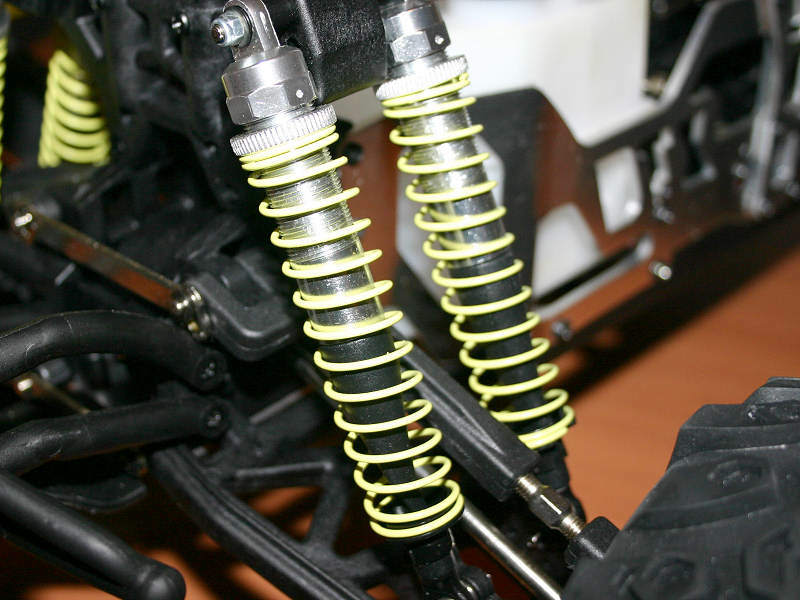 Inside the spring, rubber boots prevent contaminants from damaging the shock shafts and helping to extend the life of the seals. This is very impressive hardware that they’ve used as a box stock option. Excellent job Duratrax! Before I could hit the dirt with the Duratrax Warhead, there were a few tasks I needed to perform first. First on the list was preparing the receiver’s antenna, so that it would receive a good strong signal. I threaded the antenna through the supplied tube and then mounted it into the hole on the receiver box’s lid. I noticed that the tube was somewhat loose, so I grabbed a small section of Dubro heat shrink tubing to help secure the tube in place. On the other end of the tube I used a Dubro antenna end cap set (part #2342), which can be picked up for less than a dollar. The end cap helps to hold the antenna securely, and includes a rubber collar to hold any excess wire that’s outside of the cap. After the antenna was taken care of, I again looked to Dubro and grabbed one of their fuel filters to help make sure any incoming fuel was free of debris. Since the fuel tank didn’t have a filter in it, I figured an external filter on the truck would be wise. In fact, even with in-tank filters, I still prefer to run an external filter on my vehicles as added protection. A quick snip of the fuel line, followed by pushing the filter into place and I was done. The Dubro filter comes in a variety of colors, with the red one I used being Dubro part number 2307. The foam air filter for the Warhead is void of any oil. So you’ll want to ensure you apply some filter oil to it before you set out to run your truck. Duratrax does supply you with a couple of small plastic tubes of filter oil, although it took both of them before I had a good coating of oil on the filter. So I’d pick up some extra filter oil when you buy your Warhead, if you don’t already have some lying around. You’ll want to apply several drops all around the outside edges of the filter. Then knead the filter between your fingers to evenly disperse it throughout the foam element. Squeeze any excess filter oil out, and you should be left with a foam filter that is completely colored the same color as your filter oil, and slightly tacky to the touch. The next order of business is your receiver pack. While I could have gone the AA battery route, a 5-cell receiver pack is much cheaper in the long run. It’s also a much more reliable source of power. A standard -cell hump pack is a close fit, but should slide in with little problems. 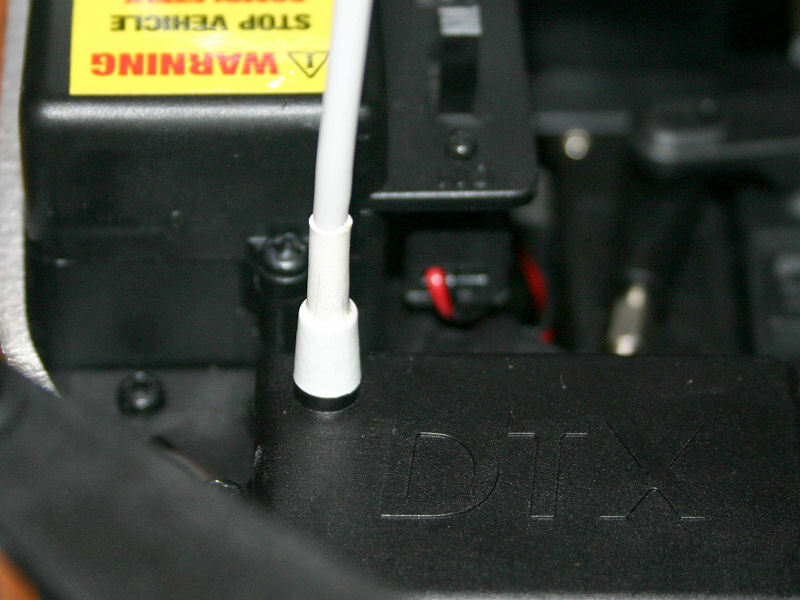 From the factory, Duratrax has placed white heat-shrink tubing over the plug that connects the receiver to the battery holder. 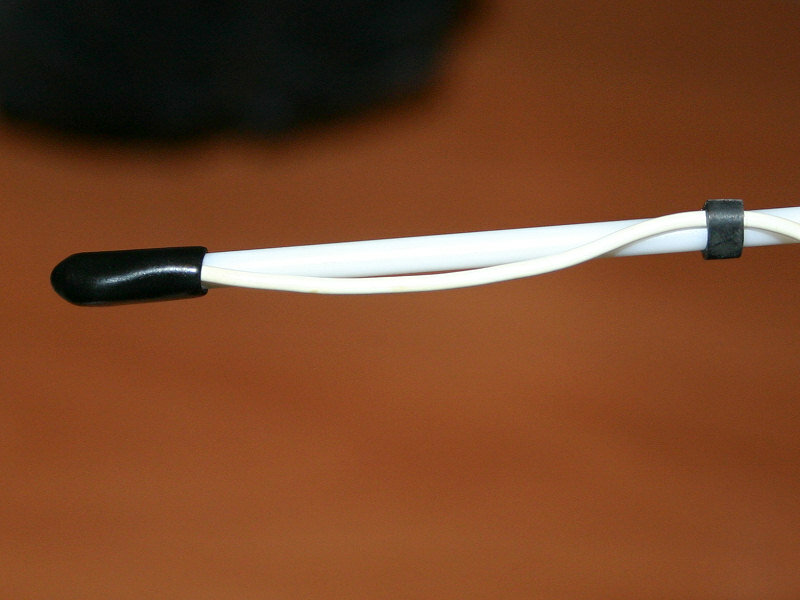 Simply cut this tubing off to access the plug so that you can use you receiver pack. Duratrax provides you a several stickers allowing you to detail the truck as you see fit. As you can see, I utilized this when rounding out the looks of my truck’s front bumper. I felt the stickers gave the truck a much more detailed look. There are also plenty of stickers that you can use on the truck’s lexan body as well. 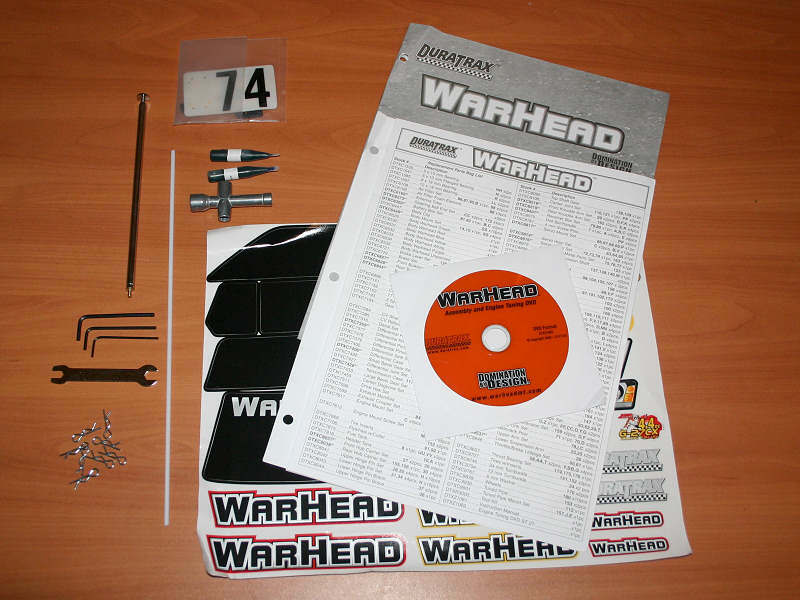 You’ll find decals to add headlights, taillights, and even label the truck as a “Warhead”. So feel free to decorate the truck as you see fit! I’m a big fan of the Dubro Body Klip Retainers, especially when going off-road. Not only does it help prevent you from losing clips, but it’s also a great way to keep the clips with the body when you’re working on the truck. So I rolled my preference over to the Duratrax Warhead as well. The last item you’ll need to address is the radio itself. Insert the antenna into the top of the radio and turn it clockwise to secure it. Then, place eight AA batteries into the base of the radio. Check to make sure you have power, and you’re ready to go! The Warhead fired up easily after I primed it, and soon I was underway. It was apparent that the throttle’s trim knob was out of adjustment after I started driving the truck. So I adjusted it to a suitable level. I also adjusted the needles some to get the truck running at a reasonable temperature of around 200°, while still maintaining a good smoke trail. Soon I had the break-in process behind me and started to tune the truck for performance. I noticed that while tuning, the motor seemed inconsistent with my adjustments. This made tuning difficult to say the least. So I immediately swapped the glow plug once I saw this, knowing that the plug will often be damaged during the break-in process. 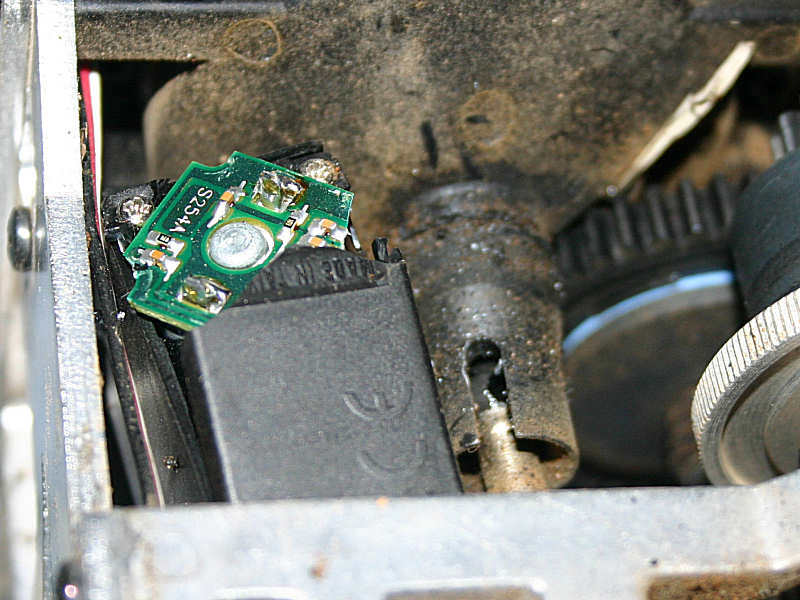 After swapping plugs, the motor’s temperament evened out substantially. 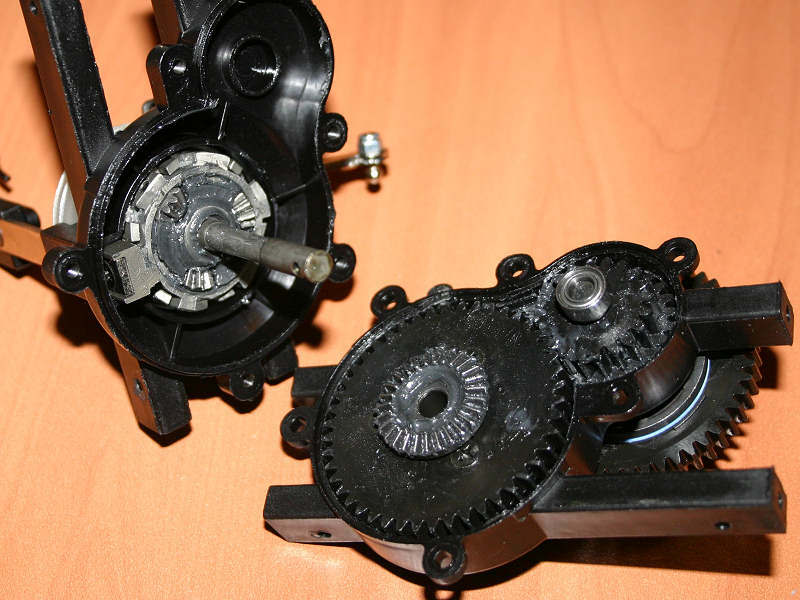 After properly tuning the motor the shift to second gear occurred at the proper point in the powerband, just as the motor seemed to reach a crescendo of its output in the lower first gear. 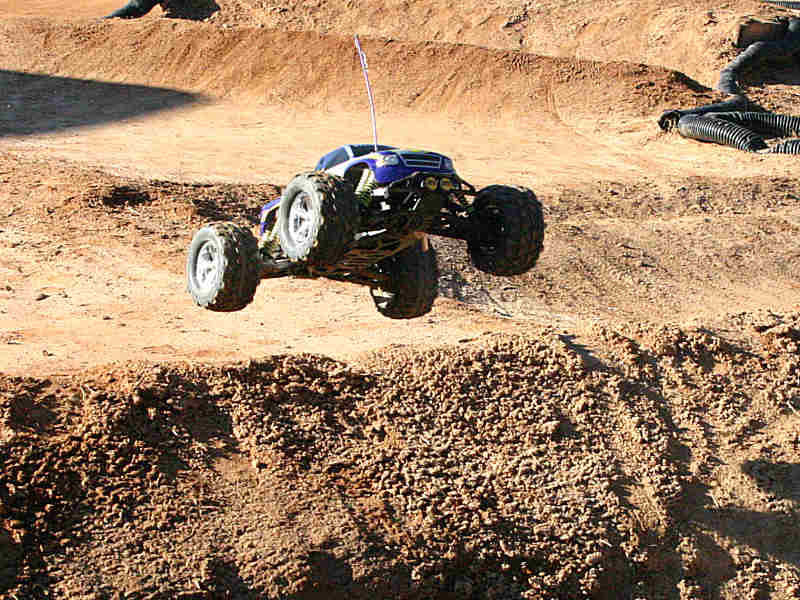 It was obvious that the SuperTigre motor was laying down some mean power to the drivetrain. 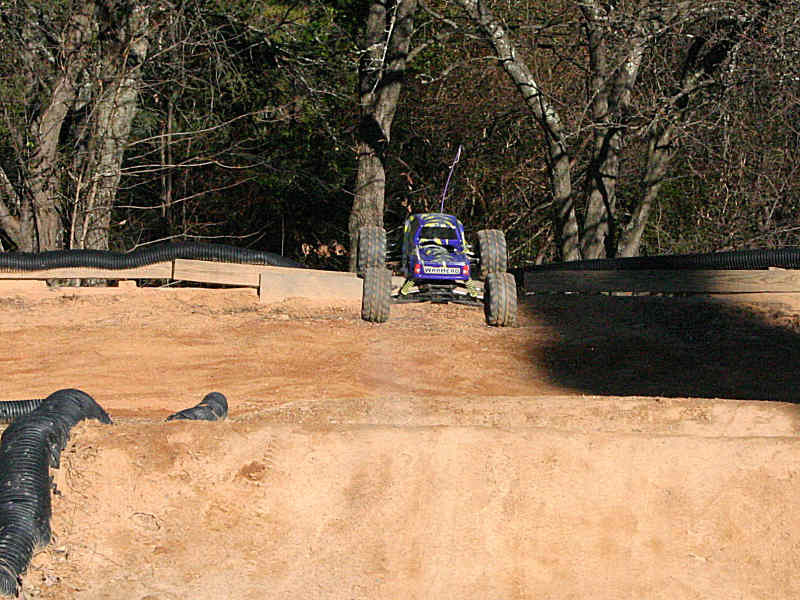 So with the tuning completed, I decided to venture away from the pavement and head to the dirt in the backyard. I mounted the body on the Warhead, eager to get to the truck’s natural habitat. I started off by driving around in the backyard getting a feel for how the truck would handle being in the dirt. Initially the stock tires didn’t grip as well as I thought they might, in the somewhat damp dirt. Much of this was likely attributed to the leaves, as once they were gone I had more grip than I did initially. Regardless, the behavior of the truck was controllable and predictable. Racing across the backyard, and inducing a powerslide was a lot of fun. Even with the suspension set high, the truck felt much more stable than it would appear at first glance. I imagine the low placement of the motor had a lot to do with this. After running for a few minutes, the Warhead exhibited some signs of overheating. I initially didn’t cut a hole in the body’s windshield thinking that airflow from underneath would be sufficient. That didn’t appear to be the case though, so I proceeded to make a cooling hole to provide good airflow to the motor. 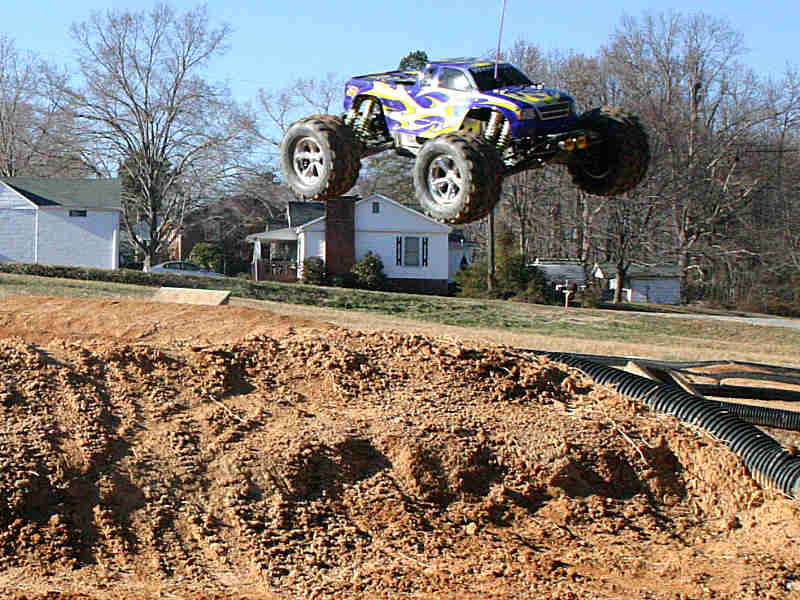 Afterwards, the truck ran perfectly as I began to eye the jumps in the backyard. 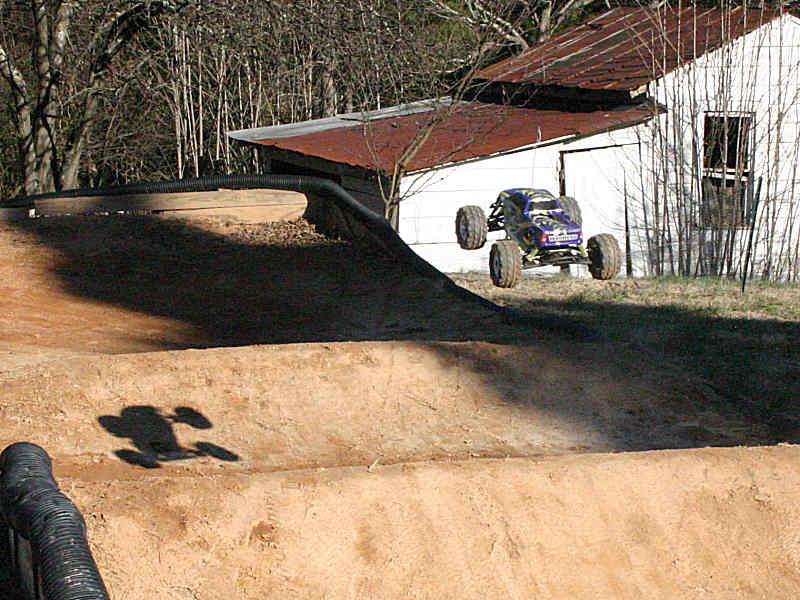 With some airtime in mind, I started hitting the dirt jumps in the backyard. While it wasn’t anything spectacular, it did give me a feel for what the truck was capable of. 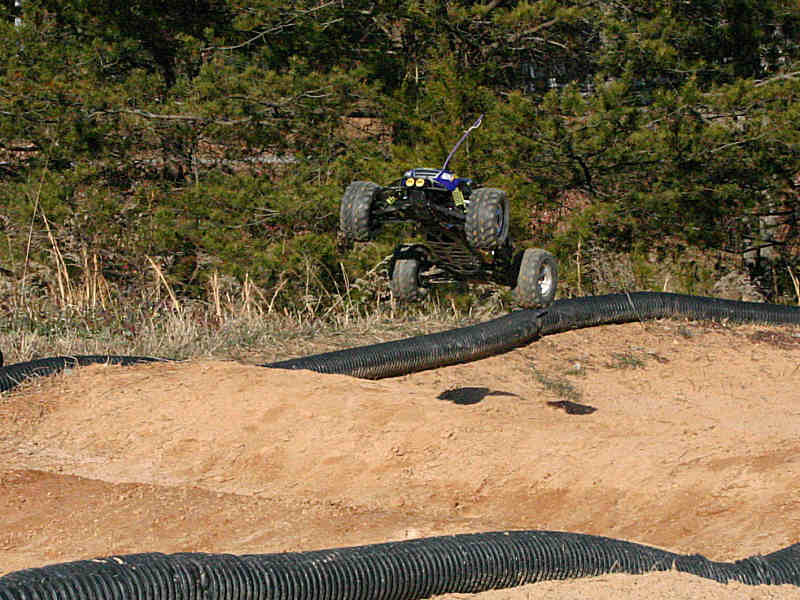 The SuperTigre motor did an excellent job of getting the truck up to speed in a hurry, which helped propel it nicely into the air when I hit the jumps. 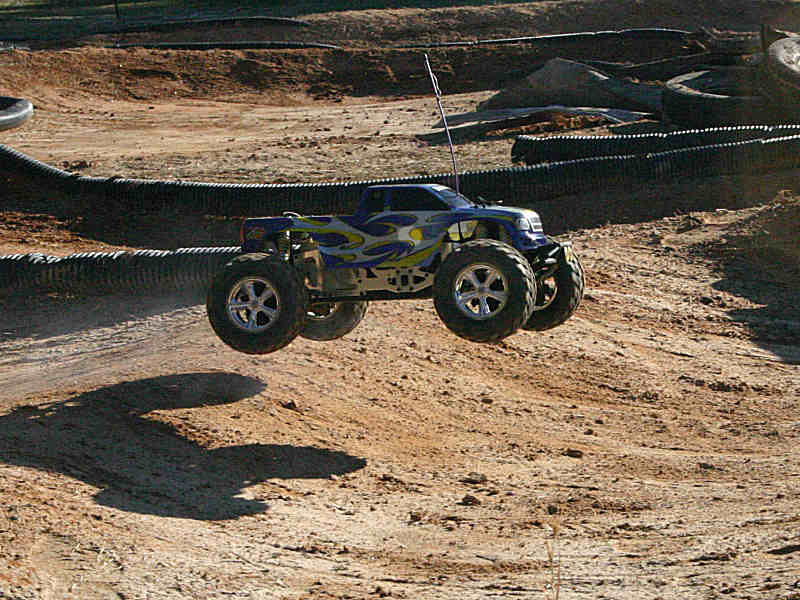 Even with the suspension set in what Duratrax refers to as “Rumble Mode”, the truck handled itself well. Much better than I would have expected out of a twin vertical chassis plate setup. Again I imagine the lowered position of the motor had quite an impact on this. I spent a good portion of the afternoon bashing in the backyard with the Warhead, and having a ball. I only ran into one issue which was quickly resolved. This issue involved the small tank, and the fact it seemed to act up as the fuel level started to get low. I’m guessing it was related to a backpressure issue, and I simply removed it from the truck and just used the large tank. For the rest of the afternoon, the Warhead ran just fine. As I packed it in for the day, I simply knew that not taking this truck to the track would be a lost opportunity. So I started to explore my schedule for a chance to do exactly that. 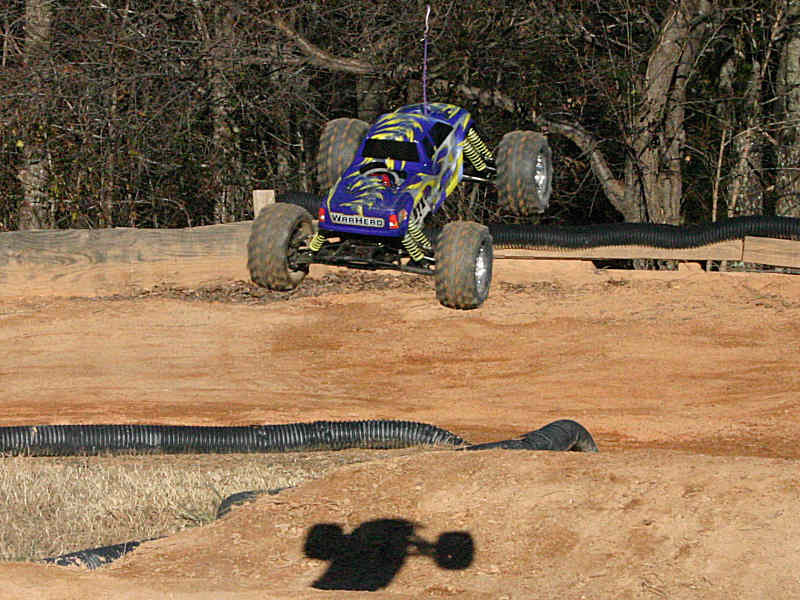 About a week later I arrived at Monkey Bottom Raceway with the truck set in its low “Race Mode” stance. Since this is the off-season, the track is undergoing some repairs and maintenance. This has taken the first tabletop out of action, and in its place is now a gaping hole. So I was prevented from running the truck around the track making full laps. Instead, I could run on one half of the track at a time. This wouldn’t be an issue though, given the tracks size. There would be plenty of area left in which to wring the Warhead out and have some fun. The track itself had dried out considerably from the last time I stopped by. While the ground itself retained more moisture than it does during the warmer months of the year, there would be no puddles to contend with. It would also likely assist the stock tires grip as well. This didn’t hurt my feelings any, as good traction would allow me to run the truck a little harder! Soon after my arrival I had the Warhead fired up and ready to go. I pulled out onto the track, while a few people that had been driving some electrics previously stood by and watched. I started off by spending my time on the second half of the track since it offered a much longer course on which to run. Once the vehicle was warmed up and tuned, I hit the first jump available in the area. The Warhead took to the air gracefully, and landed itself under perfect control as it headed around the course. As I made my way around the course, my thoughts about the conditions of the dirt held out to be true. The stock tires did grip very well, allowing me to have good traction and run the truck around the track in a fairly aggressive fashion. While it should be understood that the tires performance ability will vary depending upon the conditions, they performed very well for me that day. The truck steered very well through the corners, exhibiting a small amount of on-power push. This is typical for a four-wheel drive truck of this nature. I had heard a few rumors of extreme pushing, but I certainly didn’t experience it. Even if I had, a simple adjustment of the truck’s Ackerman would have given me much more aggressive steering. There was some bump-steer present as the suspension compressed, but it didn’t seem to affect the overall handling much at all. If needed, one could shim the connection between the steering link and the steering hub to minimize any effect it may have on handling. I was pleasantly surprised at the truck’s off-power temperament. After driving a few laps I noticed that it could cut a corner extremely sharp if you coasted through it with just a small amount of brake applied. I started using this to my advantage, and ran into the corners hard. I then applied a small amount of brake to cut the corner, and then got back heavily into the throttle upon exiting the corner and let the slight on-power push carry me out and away from the corner in a hurry. 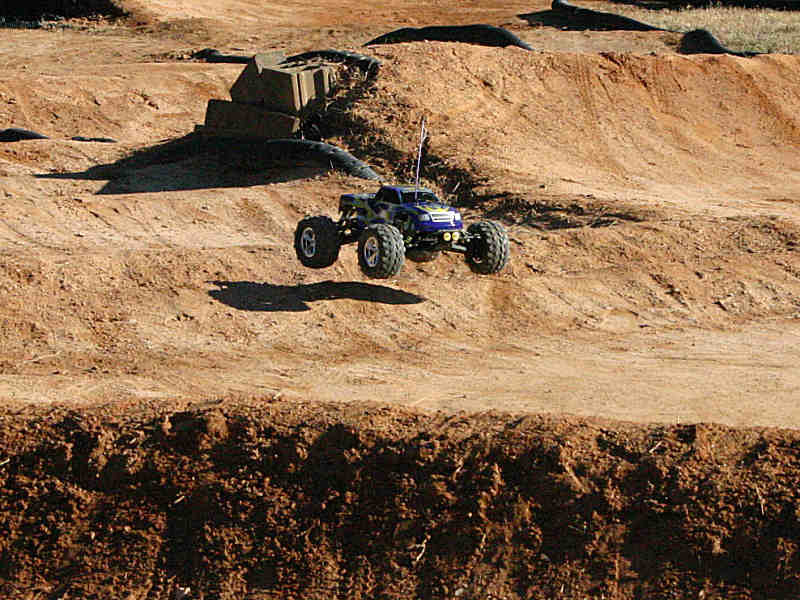 The truck remained very composed over the jumps, having a tendency to fly very level. If I wanted to try to land with the nose down, such as hitting the backside of a tabletop, a quick stab of the brakes make the truck instantly respond to my command. Later, when I would run across the double on the first half of the track, the truck could easily clear the second jump provided I maintained a controllable line through the first corner after the straightaway. 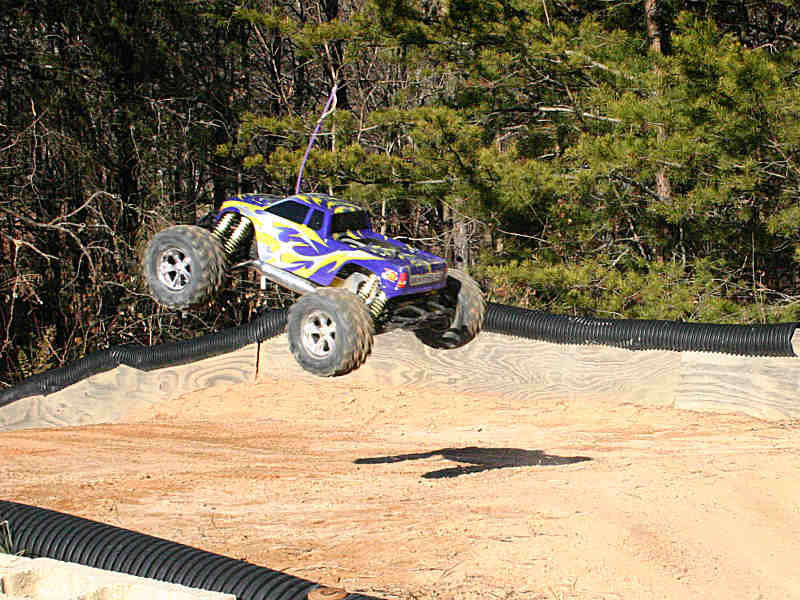 The truck certainly liked being in the air, and the SuperTigre motor gave it the ability to get there! Going through the washboard-style section of the track was the only area that gave me any problems with the truck at first. Trying to run through this section would upset the balance of the truck, which is typical of about any vehicle that runs through it. Once I got comfortable with the feel of the truck, I developed a rhythm through the section that’s similar to other vehicles I’ve run around the course. Simply hit the small bumps in pairs or singles, getting on and off the throttle as needed. This kept the suspension firmly planted on the ground, and allowed me to stay in good control through this area of the track. I used a similar approach for the triple just before the last corner. There’s a wide sweeping turn before hitting the triple, so I would get a good run through the turn and clear the first two piles and come down between the second and third jump. Then I would simply pop over the last one and cut around the turn and head down the straightaway. The weight of the truck made trying to clear all of the triple fairly tough, especially after the wide turn which made you mindful of exactly how much throttle you could apply as you ran through it. The truck itself held up very well throughout the day, as I had several hard hits after misjudging some jumps and corners. The driver’s stand wasn’t open during the time I had the Warhead at the track, which made driving a little more difficult due to my perspective being different than I’m normally used to when racing. 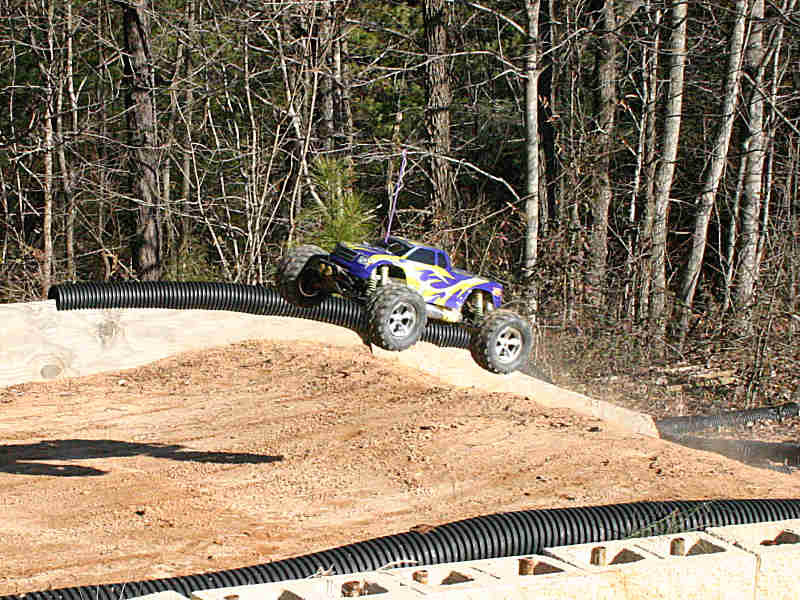 It also makes the truck a little tough to see immediately following some of the jumps. However, this worked out well in regards to testing the truck’s durability in regards to the chassis and suspension. Not one single part had an issue due to any impact I had. I did have one driveline issue however, which involved a pin from the rear dog driveshaft sliding out. This ended my day, after a run up to the triples caused it. 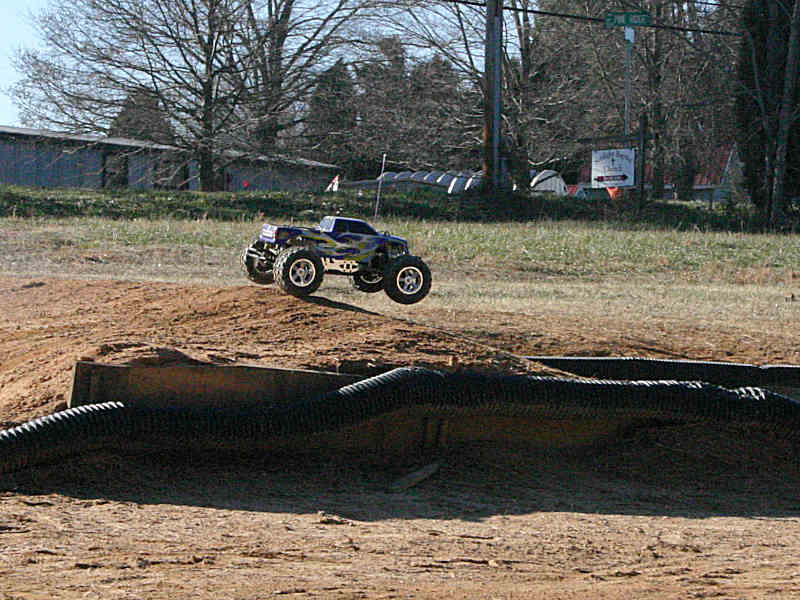 While in the air clearing the first two jumps, I grabbed some brake to bring the nose of the truck down slightly. When I did this, I heard a pop. After landing, and running down the straightaway, I noticed that most of the truck’s power seemed to go only to the front wheels. Since I had spent the majority of the day at the track, I decided to go ahead and call it a day. Later, while examining the truck at the house, the cause of my woes earlier would be found in the form of the aforementioned pin. The pin on the other end of the driveshaft had a little play as well. I’m assuming this was just a fluke, as this is not a common occurrence in my experience. The pop I had heard didn’t involve the driveshaft pin, at least not directly. As the pin just slid out, it left the driveshaft undamaged. However while the driveshaft was spinning, with the pin loose and extended, the pin contacted the case of the throttle servo and shattered it. This was likely the pop I heard just before I noticed the power to the rear wheels was lost. Despite the driveshaft issue that occurred, the Duratrax Warhead performed very well throughout my testing. The truck takes its design approach from several existing platforms and tries to combine the better aspects of them into one package. While this means the truck is more evolutionary instead of revolutionary, that doesn’t mean it’s a release to be ignored. One of the biggest strengths that Duratrax can boast is the ease at which the front and rear suspension assemblies can be removed from the truck. 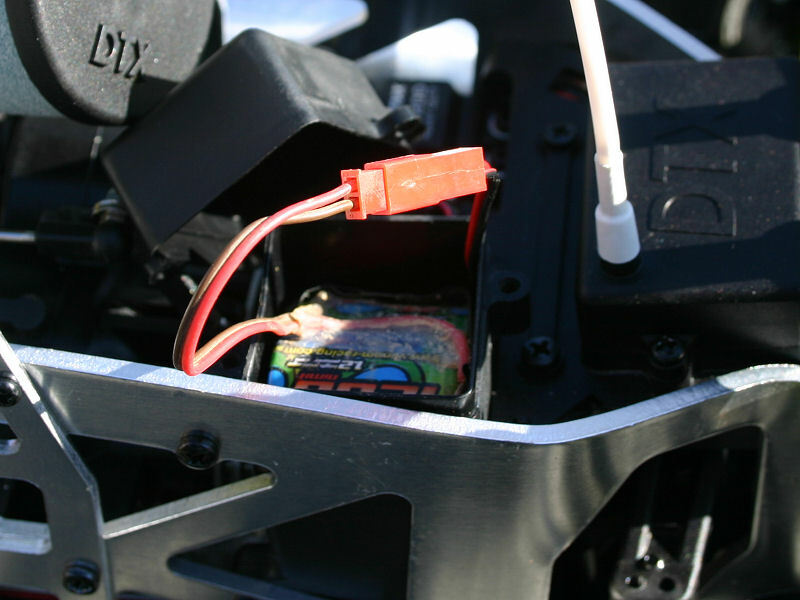 Not to mention the fact that the receiver and battery compartments are easily accessed as well! While some areas of the center of the chassis can still be a little tough to access, the ease at which the front and rear can be accessed is definitely a step in the right direction for this particular chassis style. I’ve had more fun with the Duratrax Warhead than I’ve had with a monster truck in quite some time. 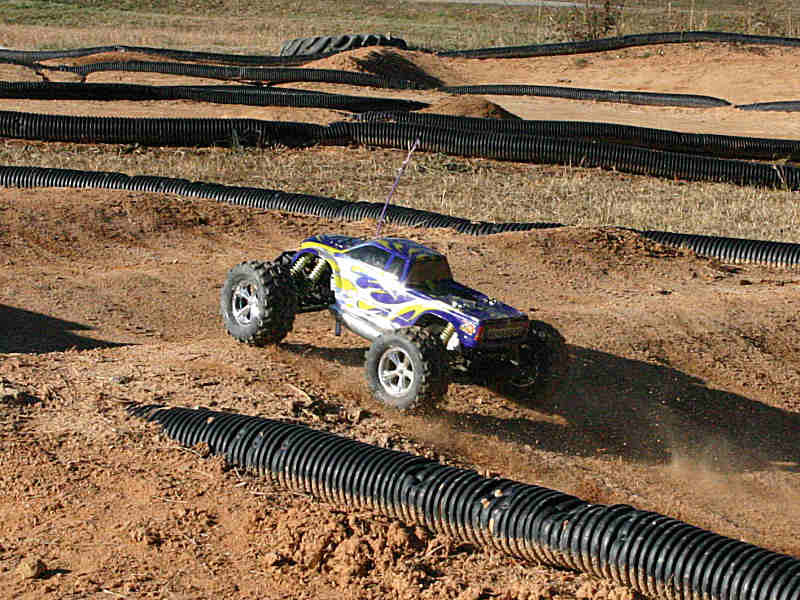 It offers a good balance of power and agility, and is a perfect choice for fans of the vertical chassis plate setup. 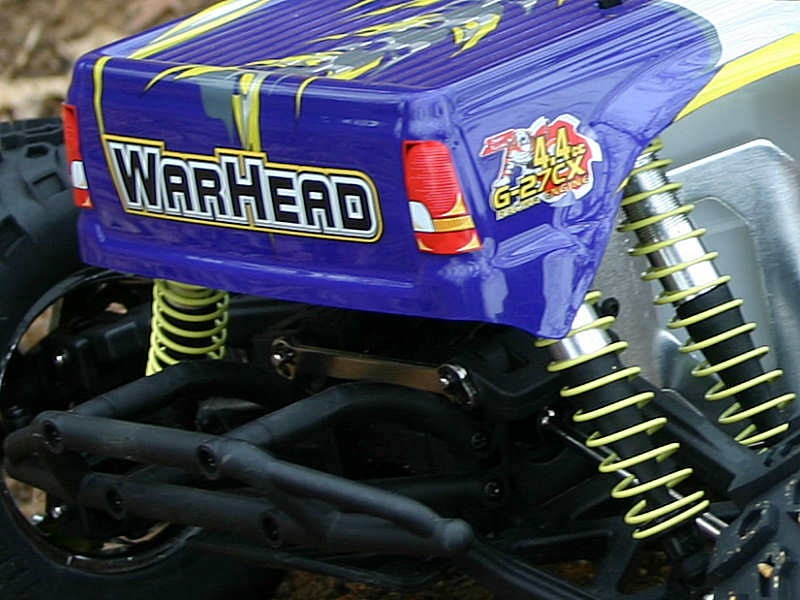 If you’ve ever wished the Savage platform had the ability to be race-tuned, the Warhead is definitely for you! Despite a few minor hiccups I ran into along the way, I feel the Warhead is a very stable platform. I do think that Duratrax ought to just skip installing the secondary mini-tank, as it doesn’t provide a lot of extra capacity anyway. Removing it reduces clutter, and seemed to make the fuel delivery system work smoother. Some newcomers to the hobby may wish for a rotary-style starter, and this would make a nice upgrade accessory for the truck. One last thing I’d like to see is good hex head hardware used throughout the truck. As I sit here finishing this review, and have wrenched on the truck several times throughout my experience with it, many of the stock Phillips head screws are starting to show substantial wear. It’s been a long time coming for the Warhead. I’m sure that the long delay in getting it to the consumer has forced some early prospective buyers to make a different purchase. However they’ll still be plenty of people that are in the market now, to support the release of the Warhead. So I don’t think its release is a case of too little, too late. Instead it simply provides another option, in the form of a durable twin vertical chassis plate approach that shows itself as a force to be reckoned with on and off the track!